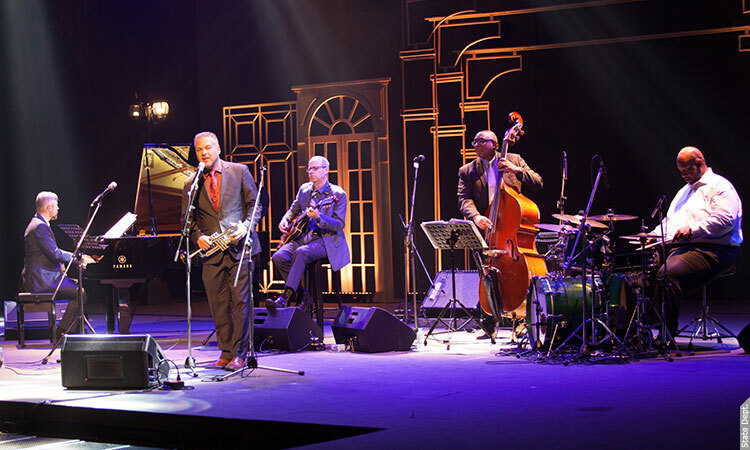 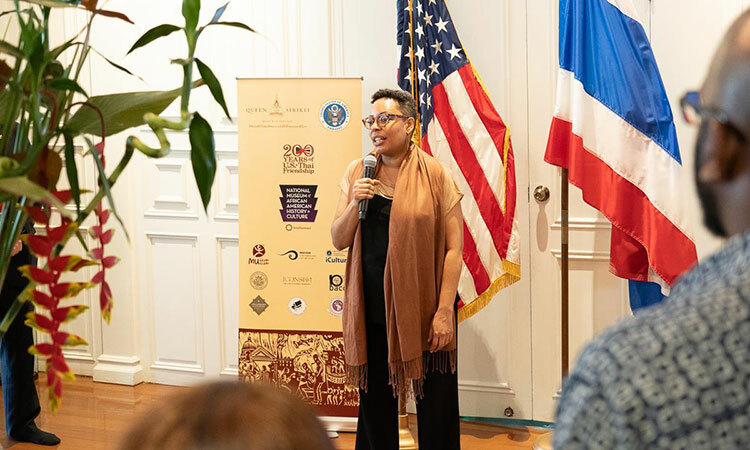 On February 28, the Embassy hosted a potluck in celebration of the Black History Month at Ambassador’s Residence. 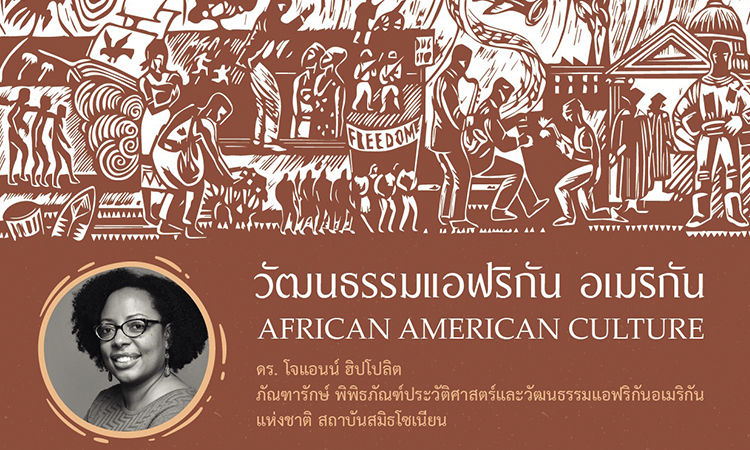 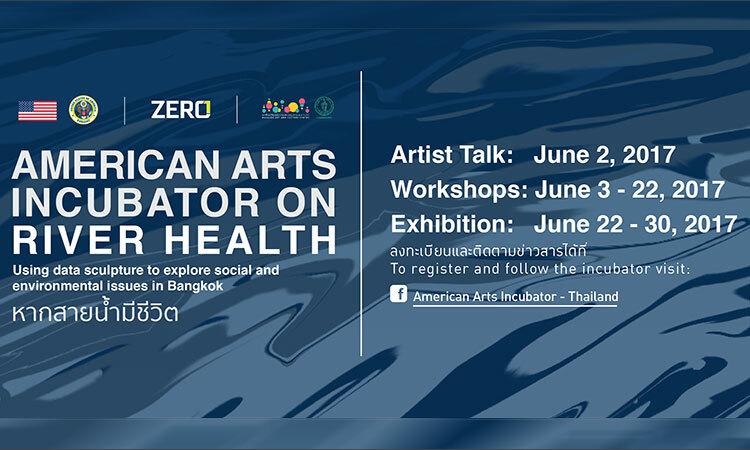 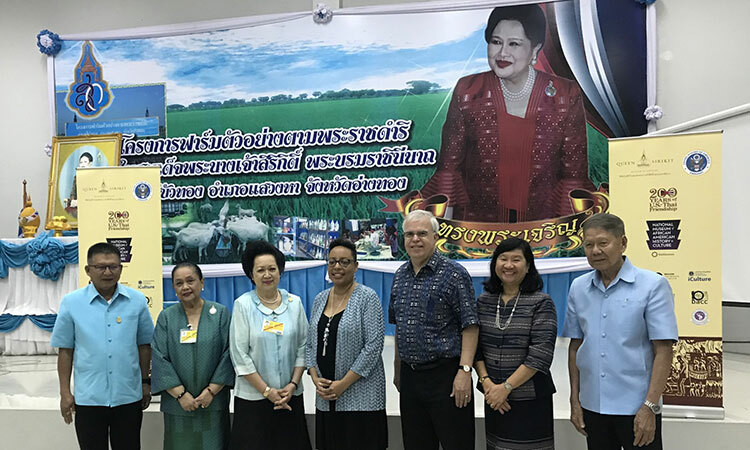 In attendance was Dr. Joanne Hyppolite of Smithsonian National Museum of African American History and Culture, who is currently in Thailand to conduct programs on African American culture and museum technology. 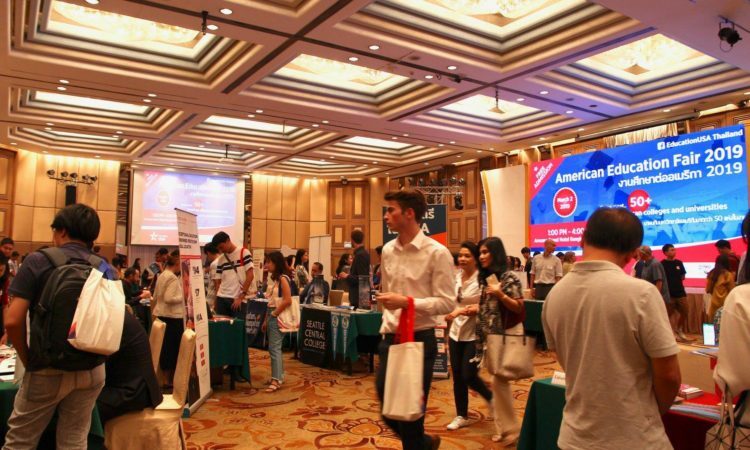 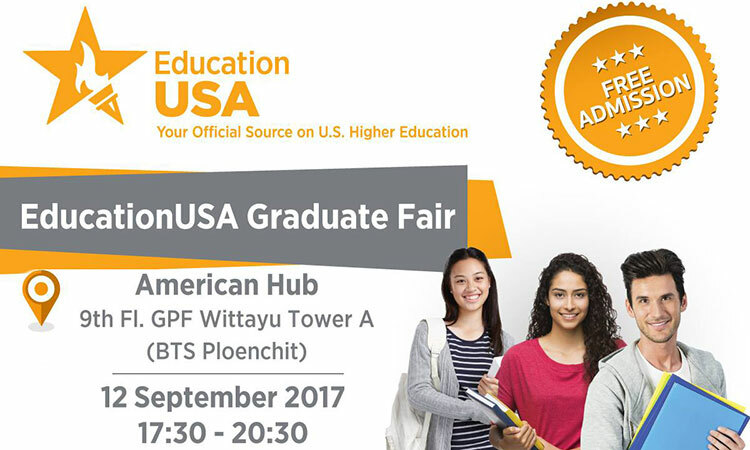 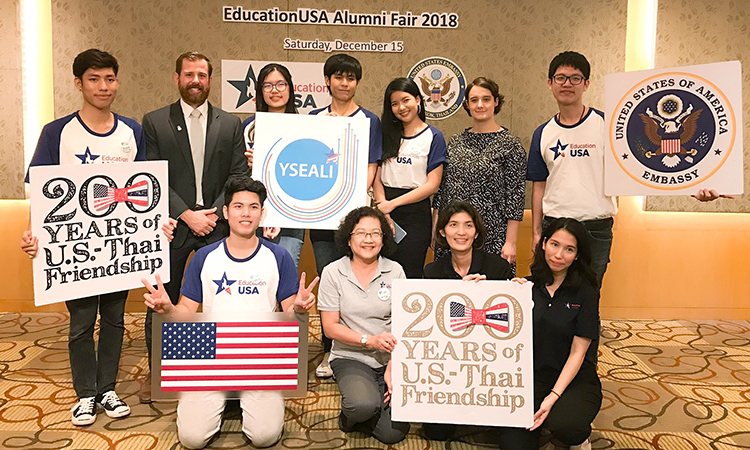 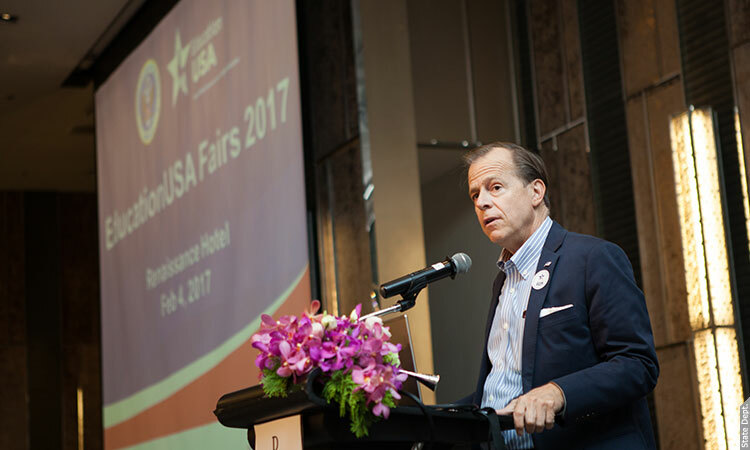 The U.S. Embassy hosted the 3rd “EducationUSA Thailand Alumni Fair 2018” on Saturday, December 15, 2018 at InterContinental Bangkok. 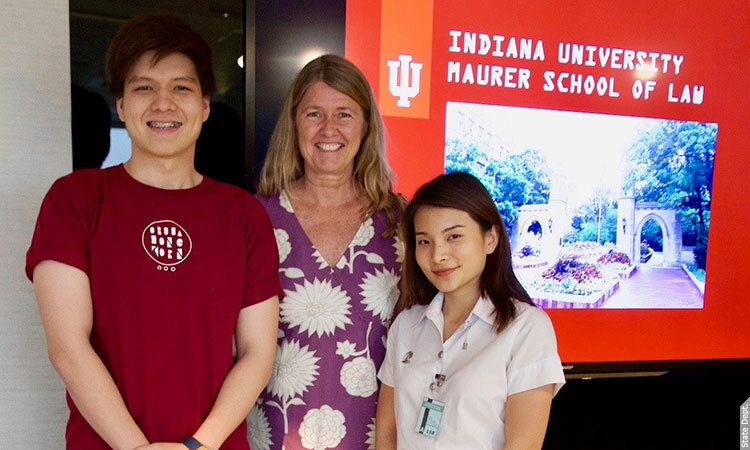 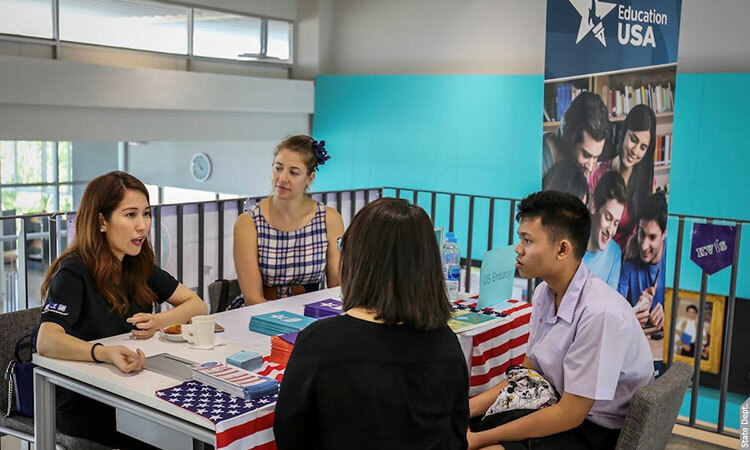 The fair brought together recently graduated Thai alumni from U.S. institutions, Regional Educational Advising Coordinators, Fulbright Thailand, and Consular Section to provide insightful information about scholarships, application process, student life on campus, and student visa. 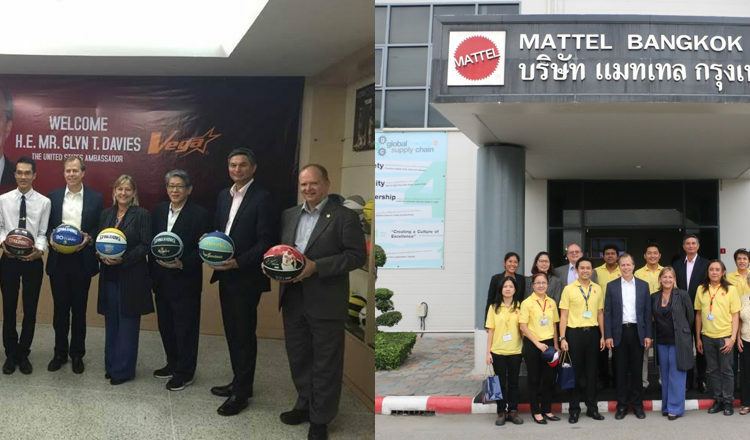 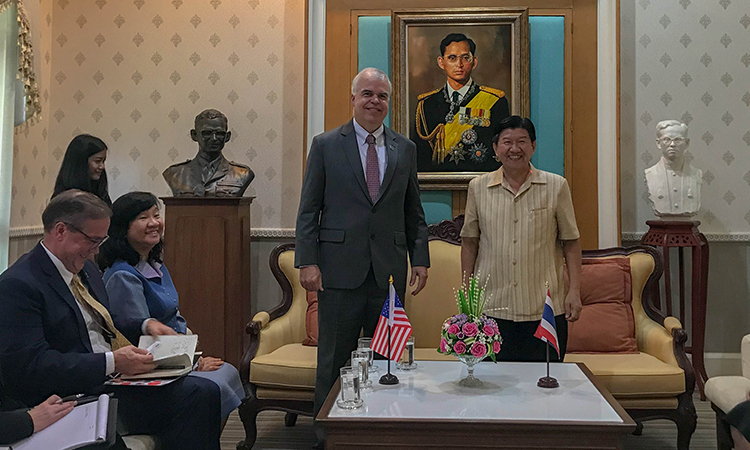 Charge D’Affaires Peter Haymond and Mrs. Haymond were delighted to meet Mr. Sirirath Chum-aupakarn, Governor of Mae Hong Son on November 30. 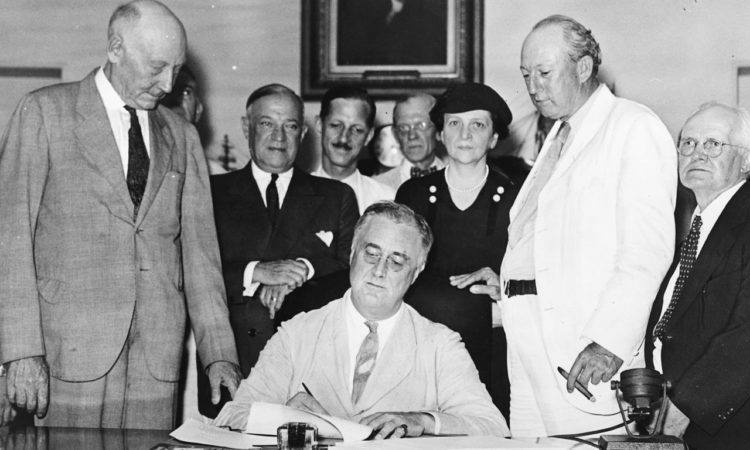 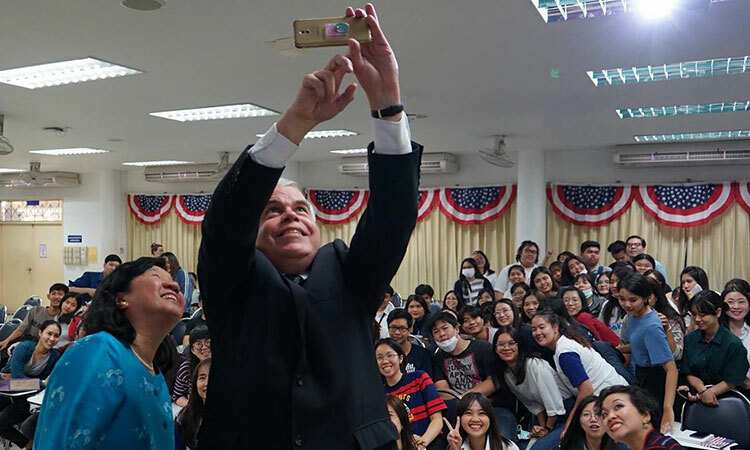 Mr. Haymond also spoke with students, academics, businesspeople, and visited a temporary shelter to demonstrate the United States’ support for education, economic growth, and displaced persons. 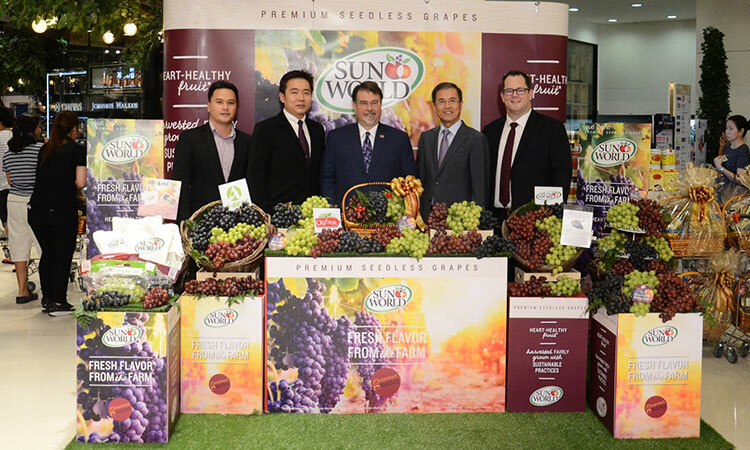 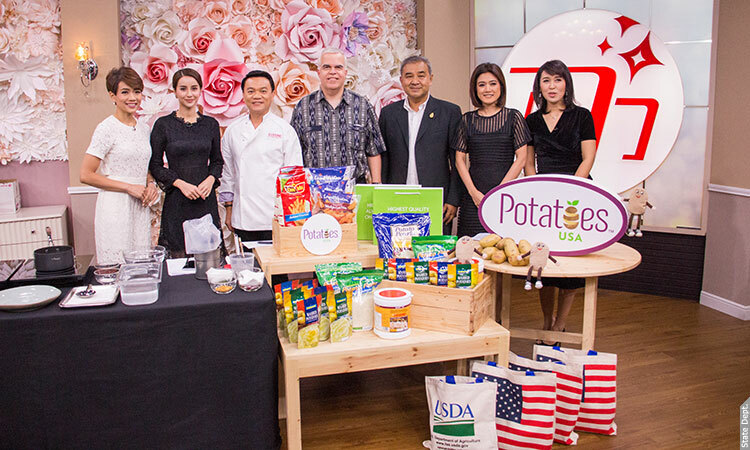 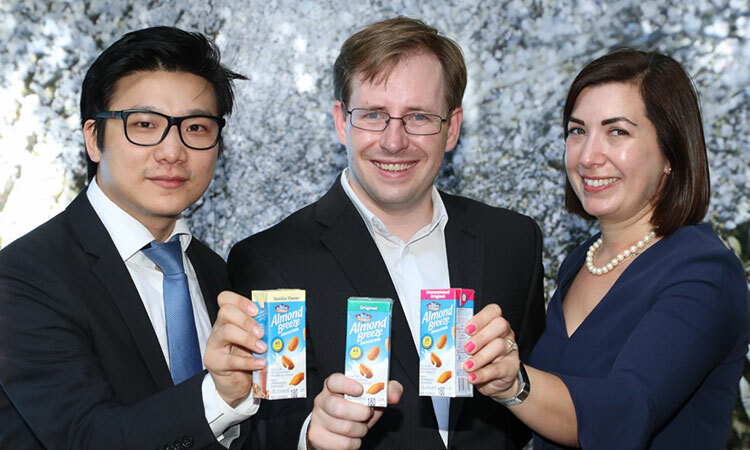 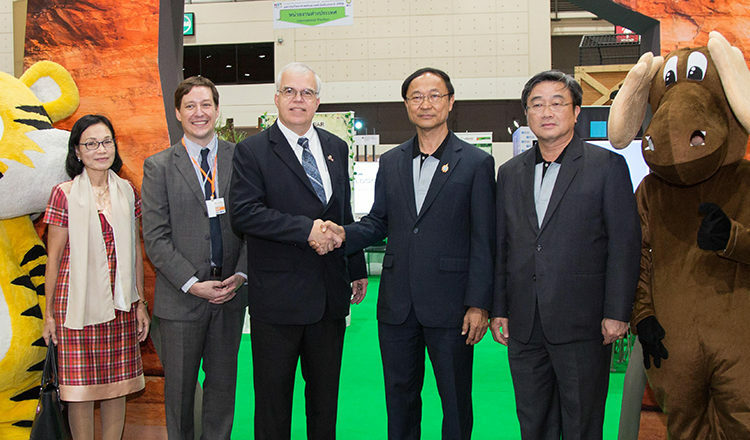 On September 21, 2018, Mr. Russ Nicely, Agricultural Counselor of U.S. Embassy attended the launch of California Grape – Sun World Grapes, imported by City Fresh co., ltd at Gourmet Market, The Mall Bangkae. 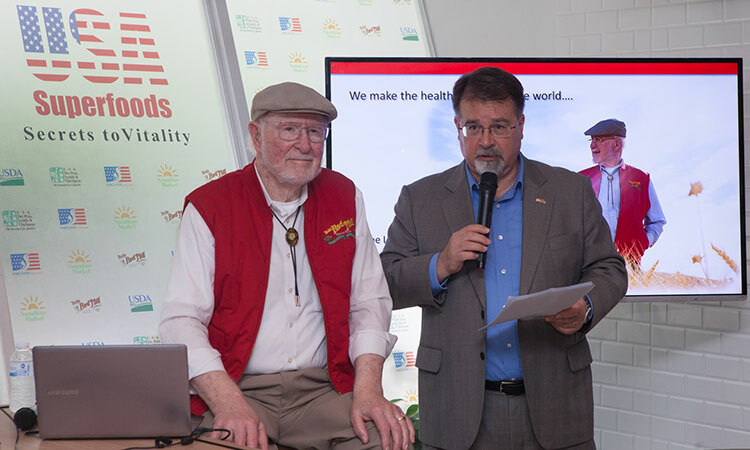 Sun World grapes will be available at all Gourmet Market. 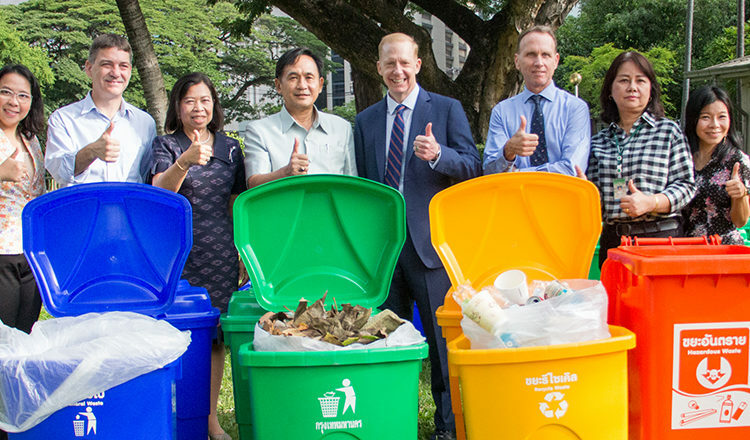 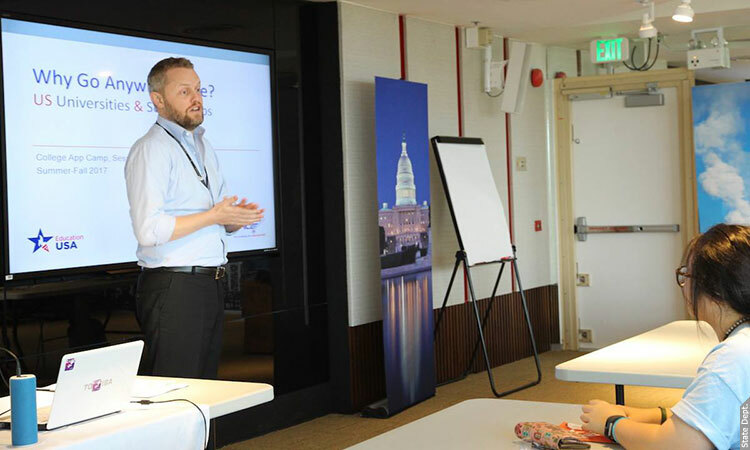 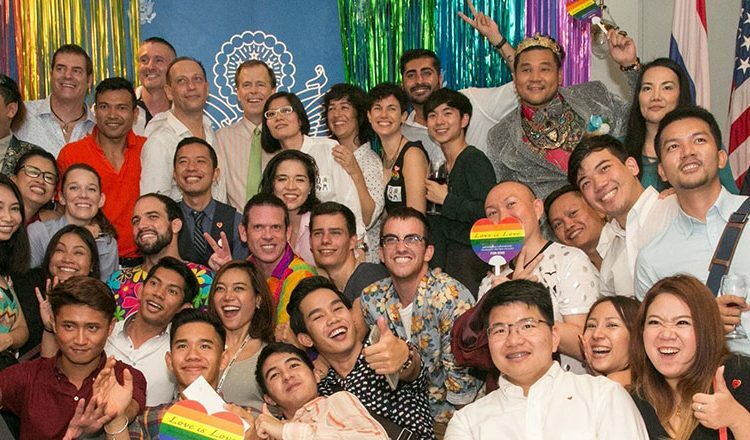 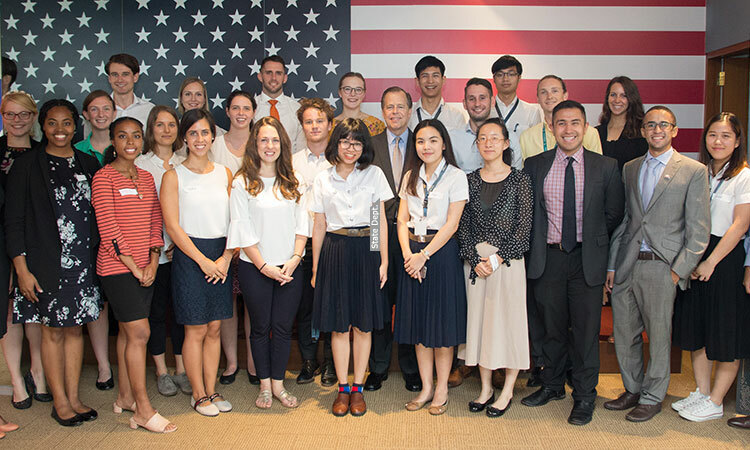 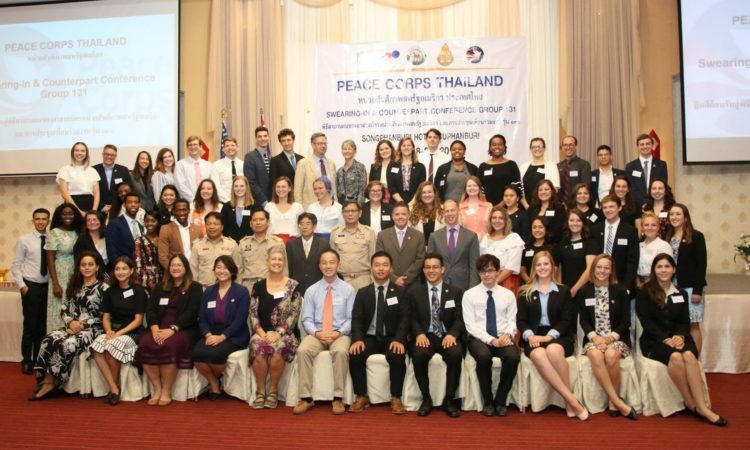 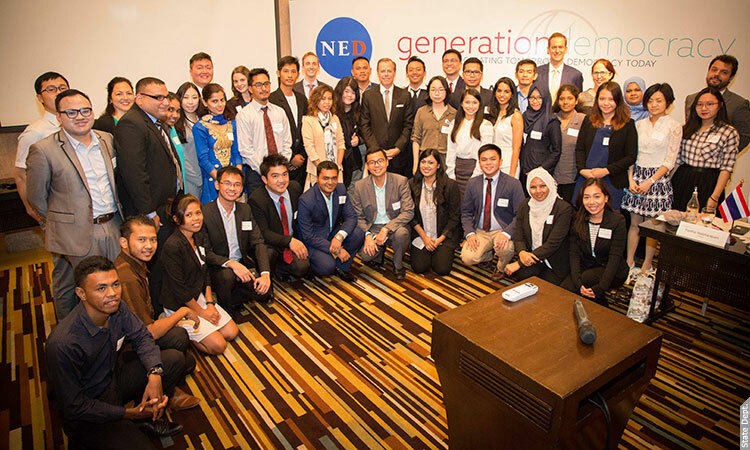 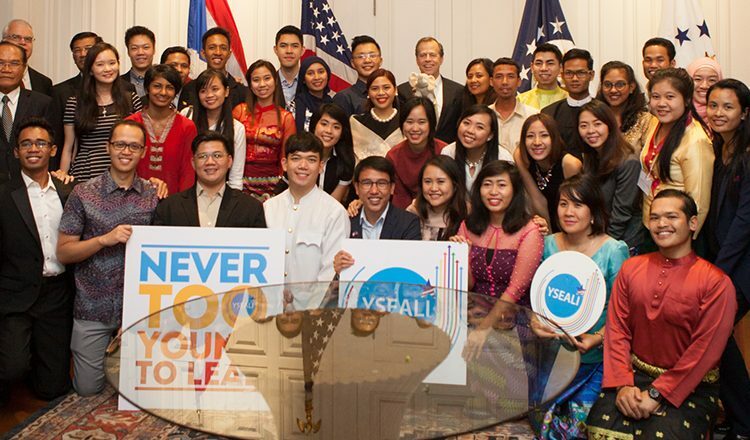 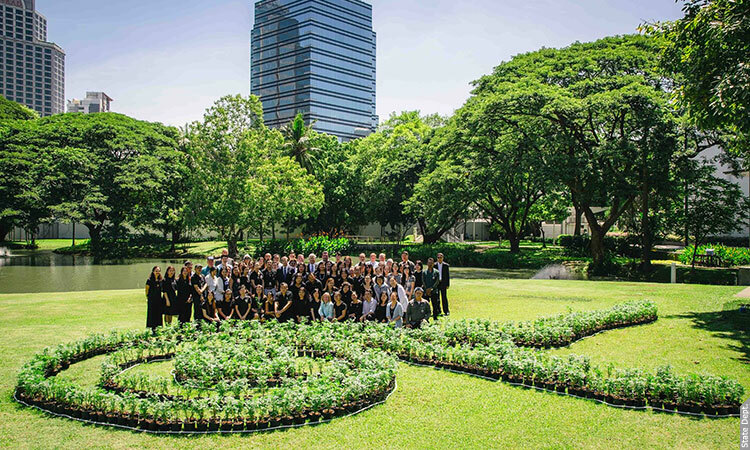 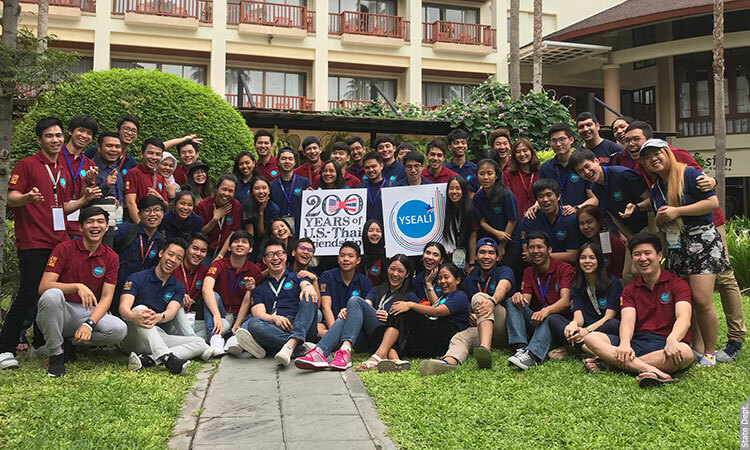 On July 19, U.S. Embassy Rangel Fellows hosted National Intern Day, which brought together dozens of interns working at the United Nations and in various embassies across Bangkok. 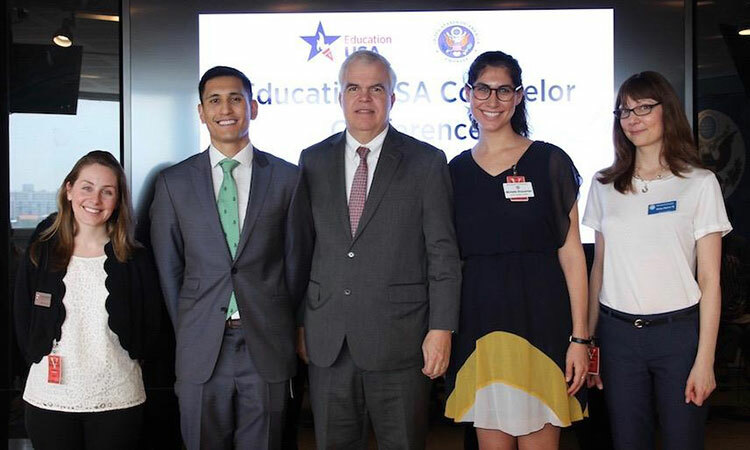 It was a great opportunity to discuss diversity initiatives in the U.S. State Department and network with young people interested in foreign affairs. 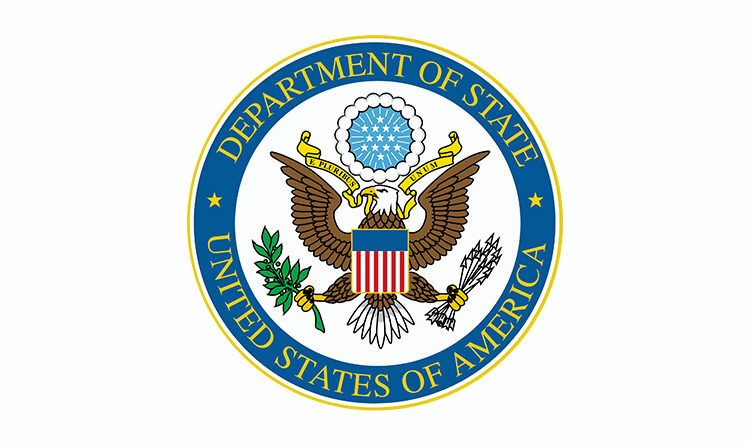 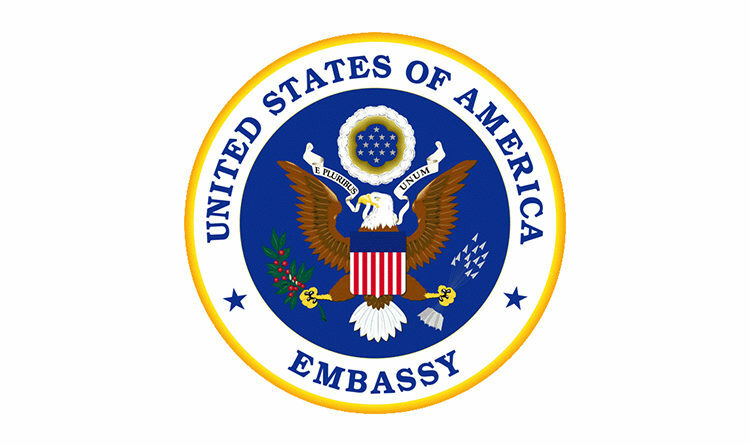 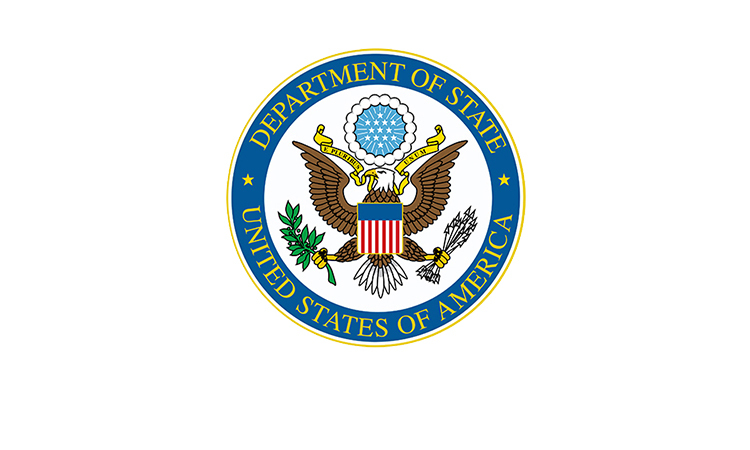 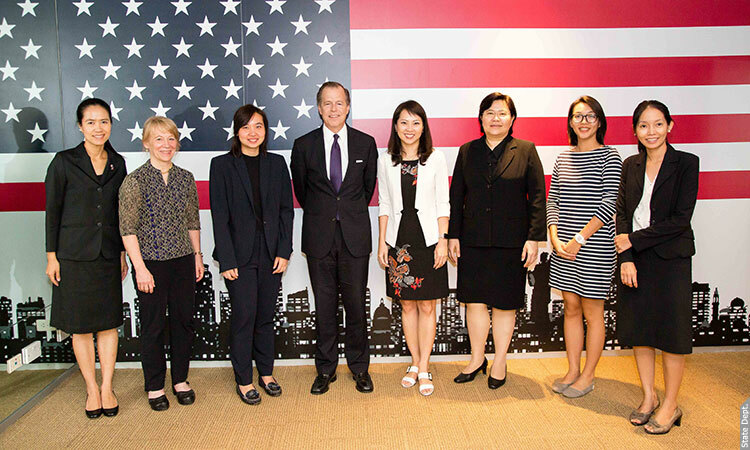 By U.S. Embassy Bangkok | 4 April, 2018 | Topics: Deputy Chief of Mission, Education, Events, Study in the U.S. 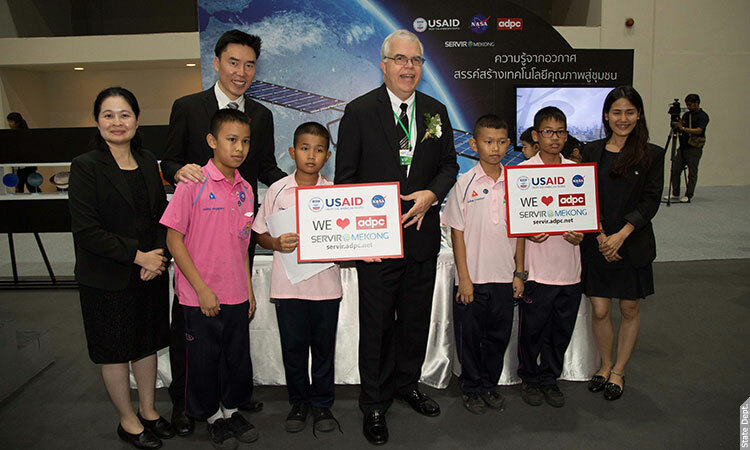 Ambassador and Mrs. Davies recently visited Kamphaengphet and Phitsanulok to visit U.S. company Monsanto, observe cutting-edge bilateral infectious disease research, discuss with local officials, talk to Naresuan University students about 200 years of U.S.-Thai relations, and visit Kamphaengphet Historical Park with a local Peace Corps Volunteer. 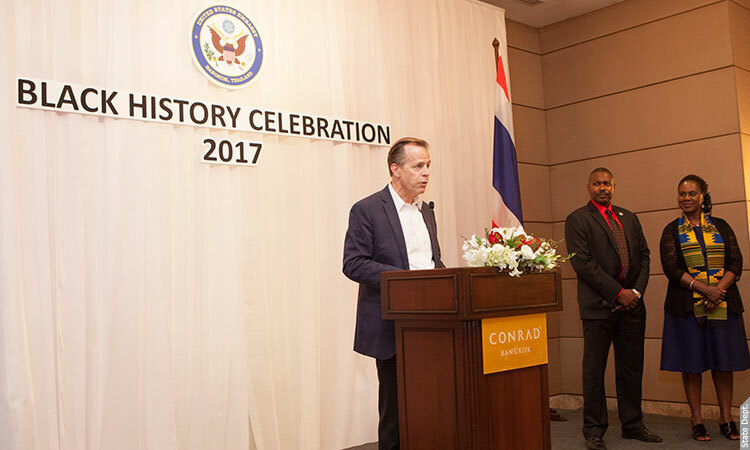 Ambassador Glyn Davies commemorated Veteran’s Day in a ceremony that paid tribute to those Americans who have served or continue to serve in the U.S. military, and honored those who paid the ultimate sacrifice while serving in the armed forces. 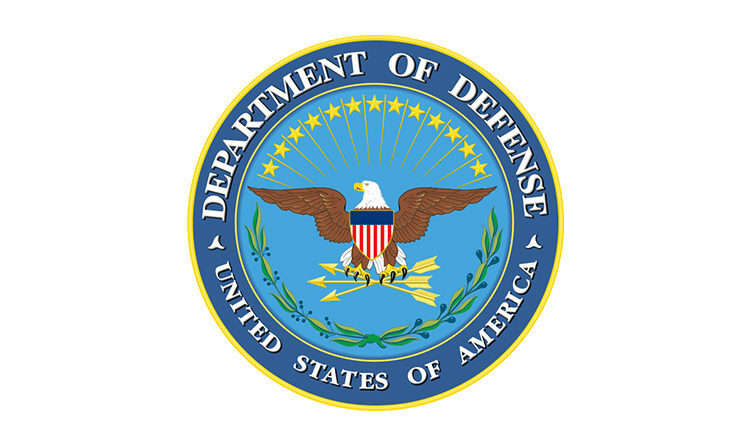 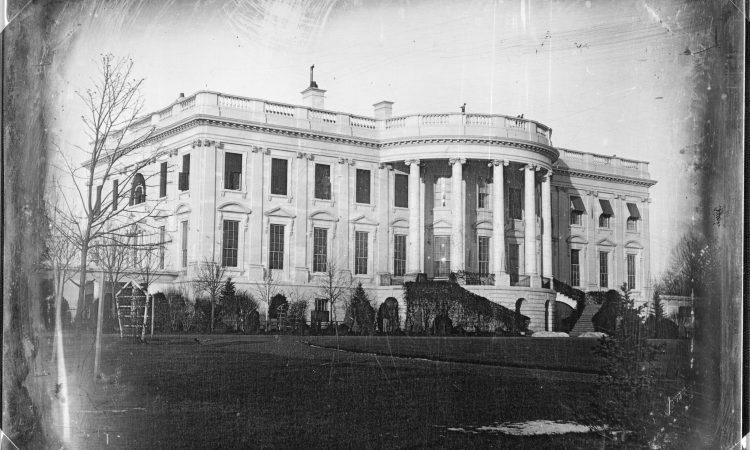 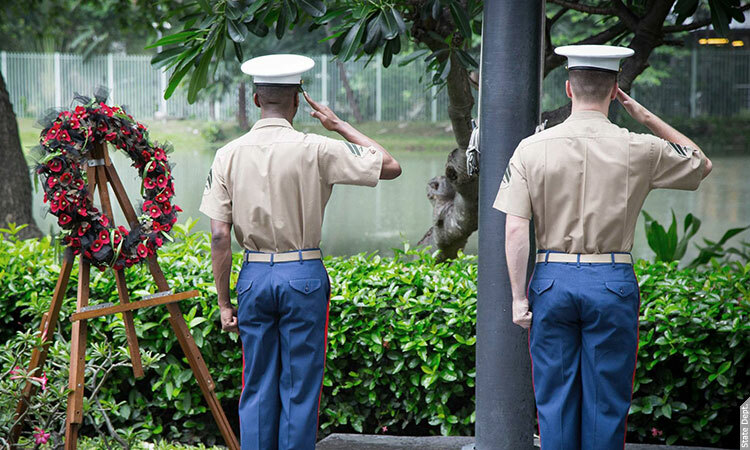 Veterans’ Day is celebrated in the United States each year on November 11. 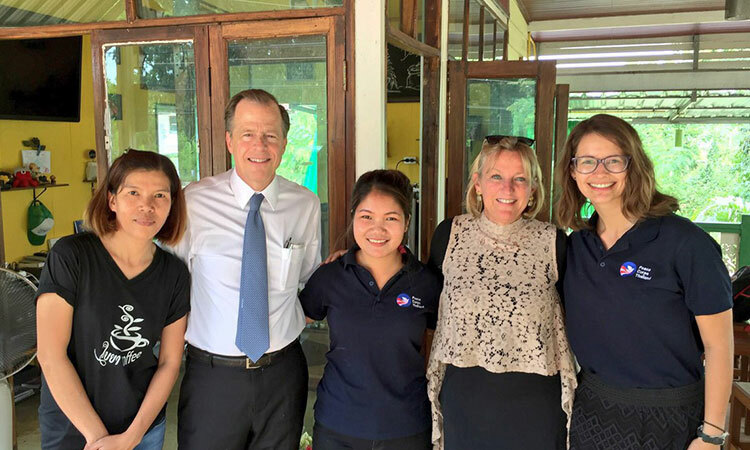 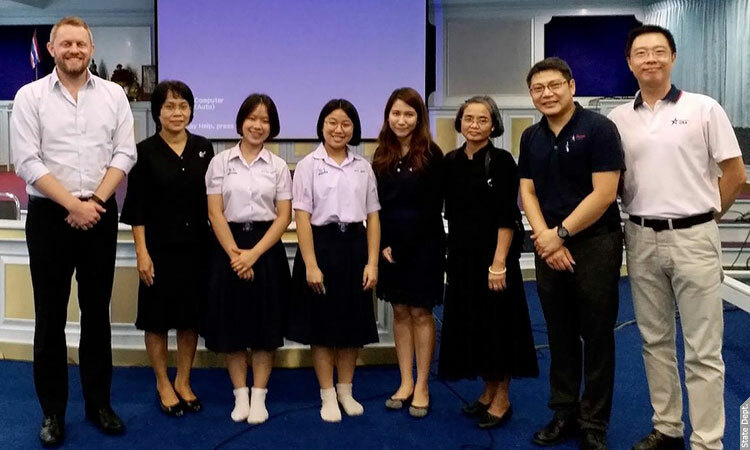 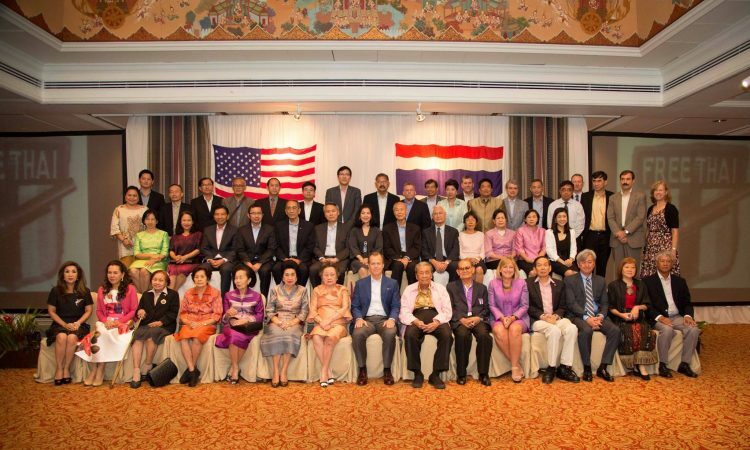 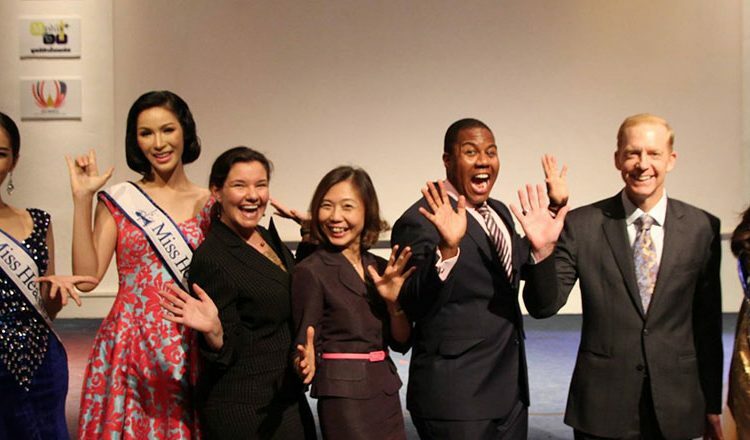 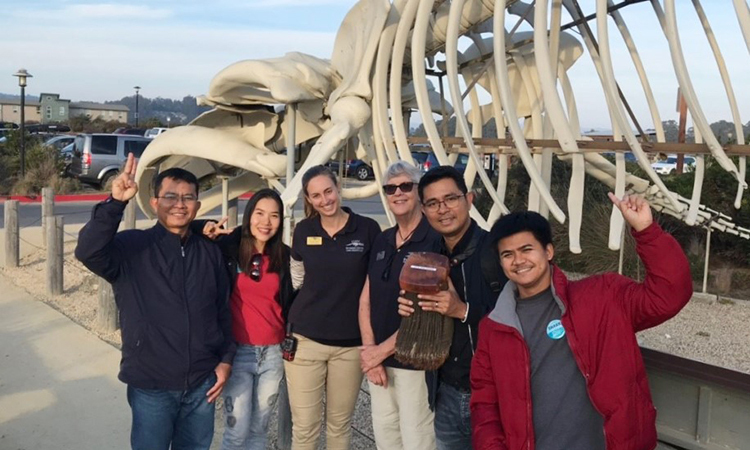 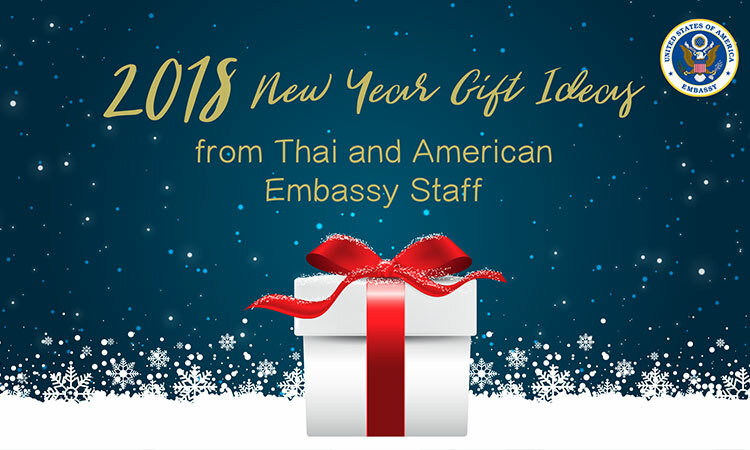 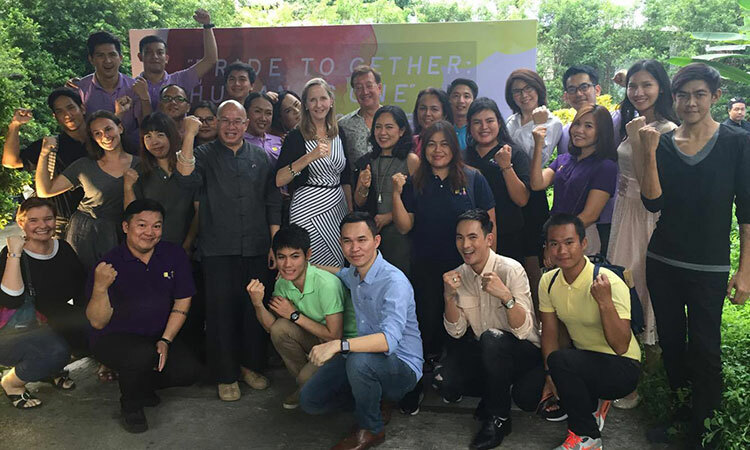 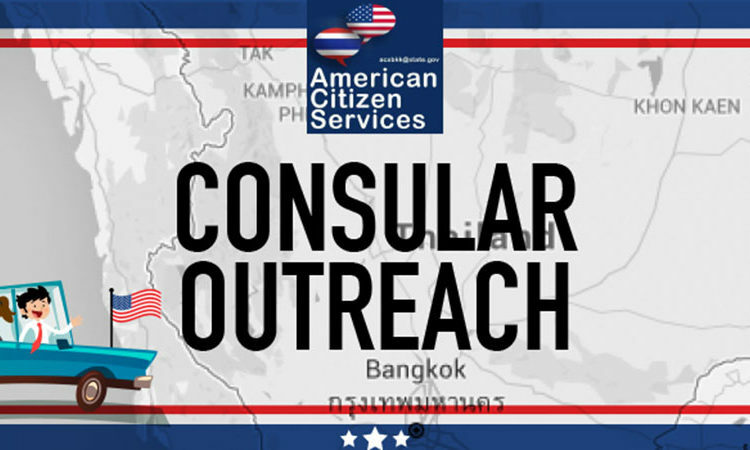 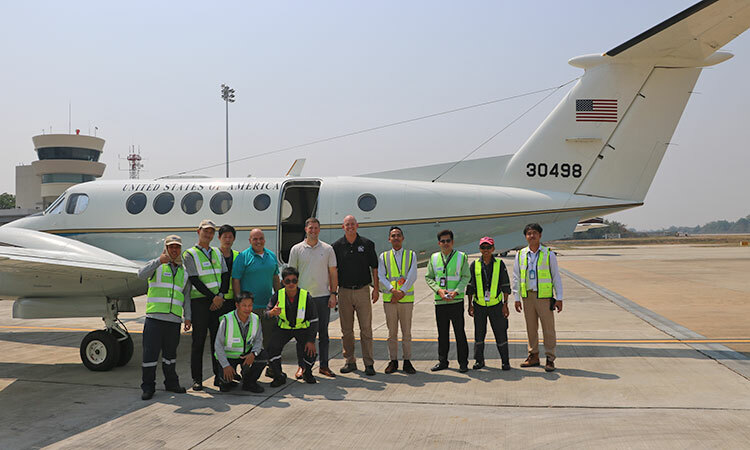 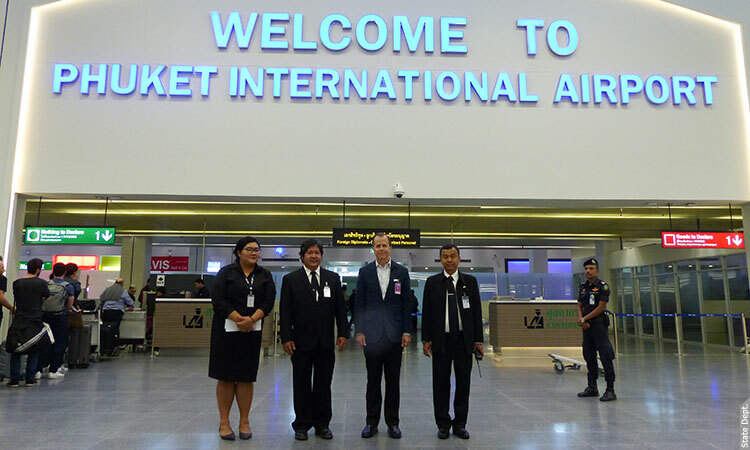 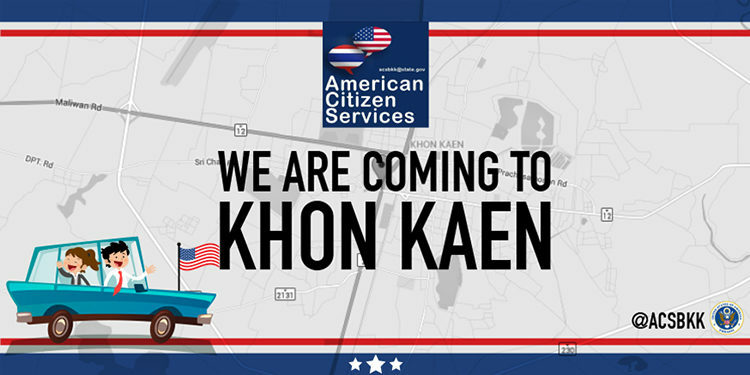 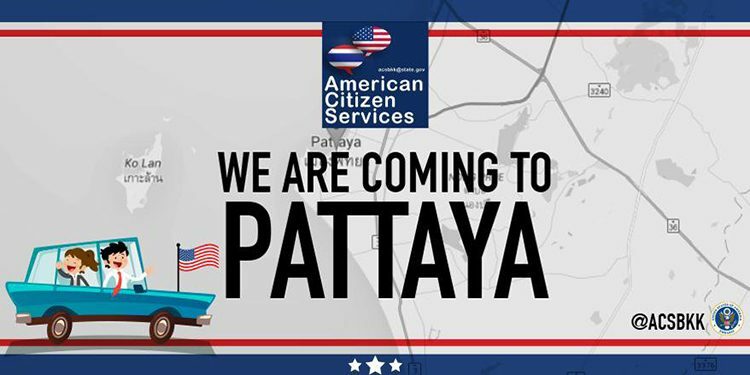 U.S. Embassy Bangkok relies on a team of roughly 45 Volunteer Consular Wardens to help meet the routine and urgent needs of Americans in the Kingdom. 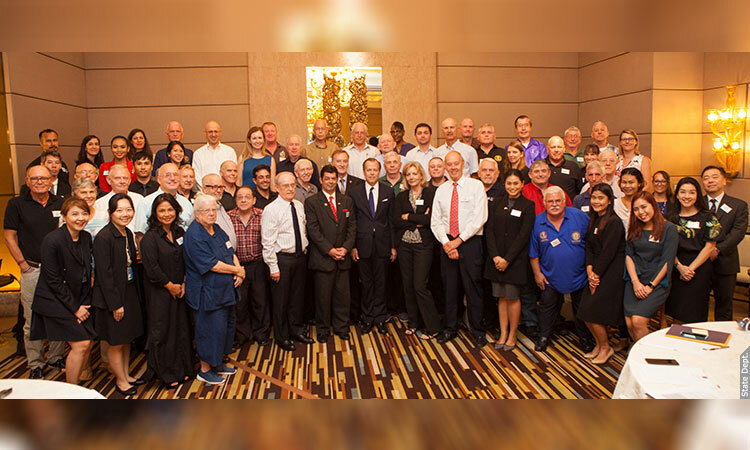 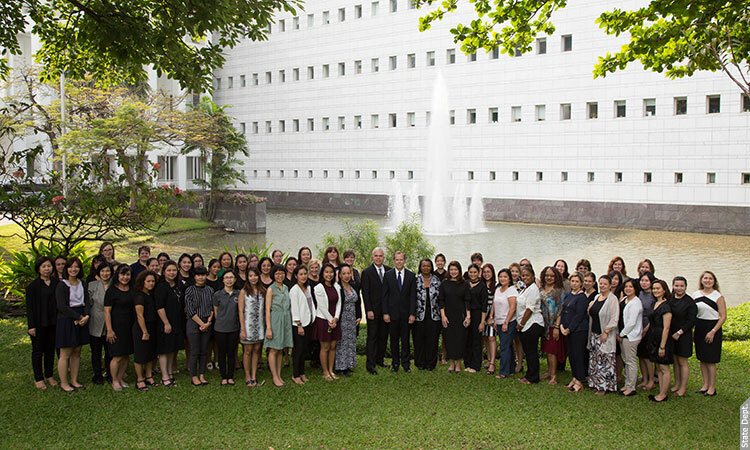 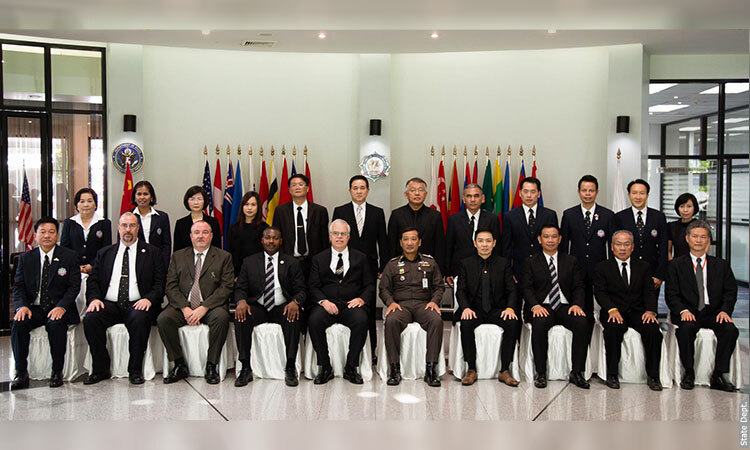 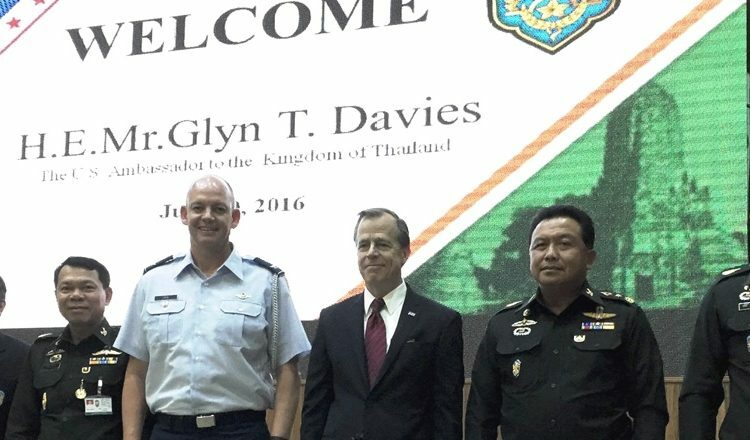 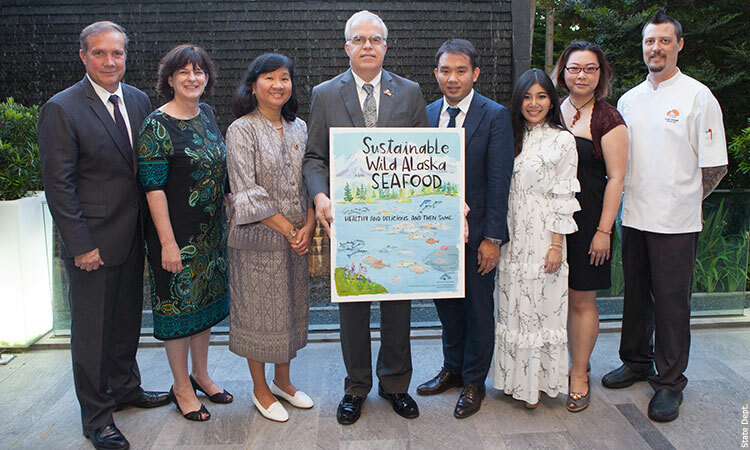 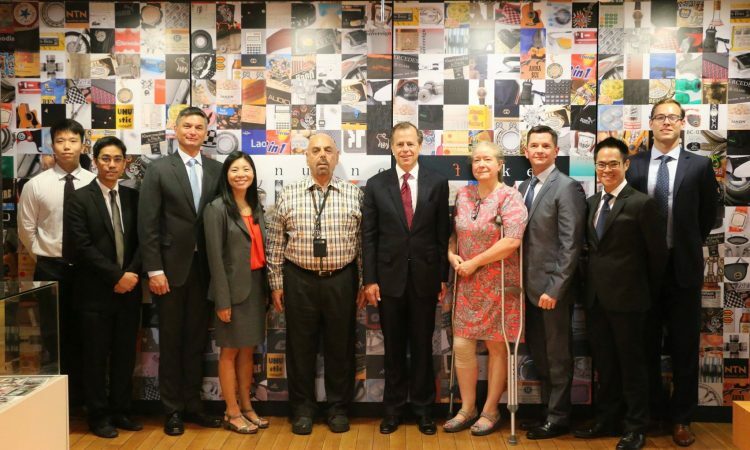 Ambassador Glyn Davies joined the U.S. Embassy’s American Citizen Services team on September 15 to thank the wardens for their outstanding service to Americans both living and visiting Thailand. 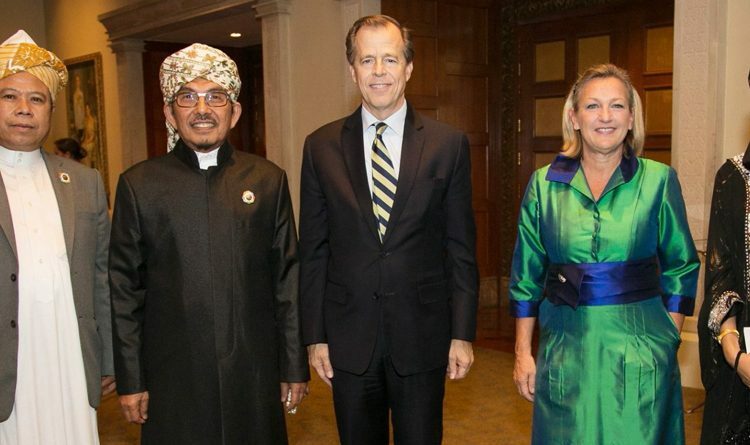 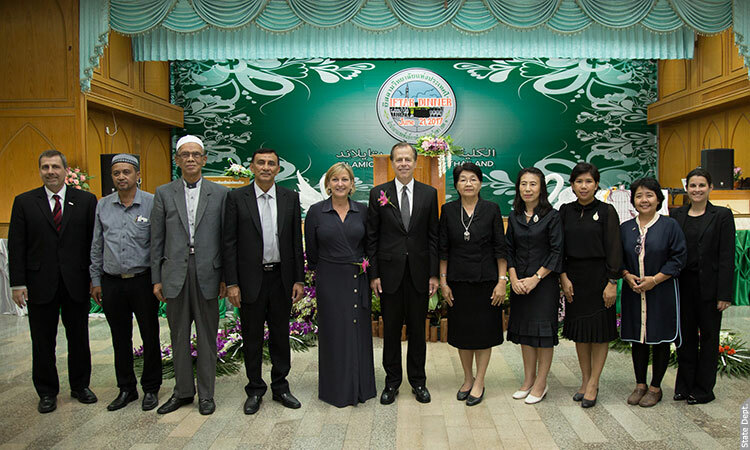 Ambassador and Mrs. Davies broke the fast in celebration of the holy month of Ramadan at the Islamic College of Thailand (ICT) on Wednesday, June 21. 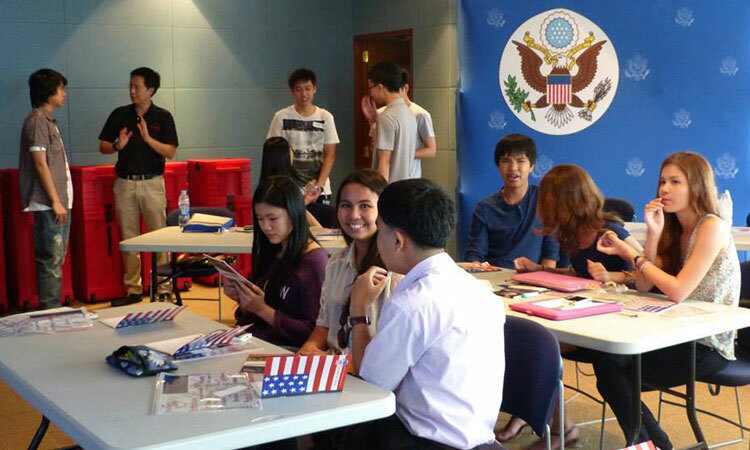 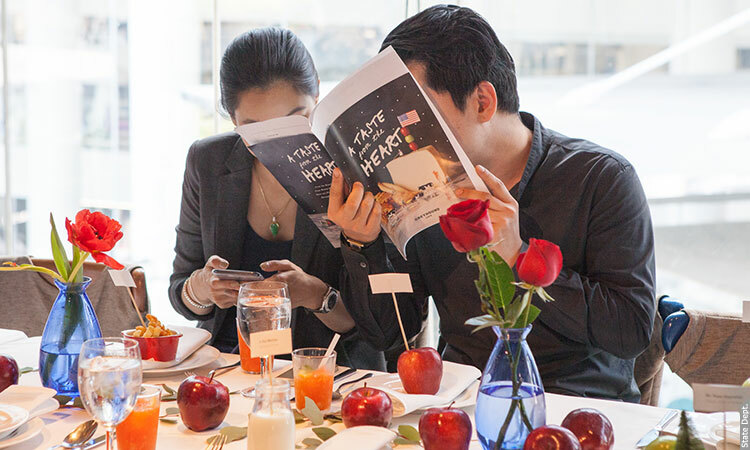 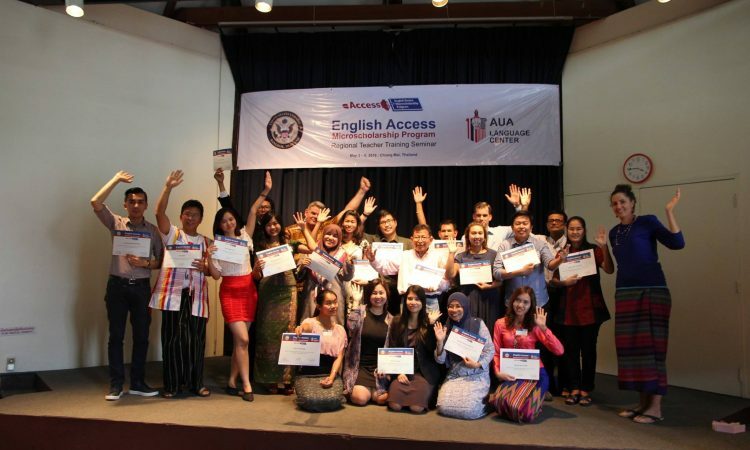 Prior to the meal, U.S. Embassy staff hosted English language activities for ICT students. 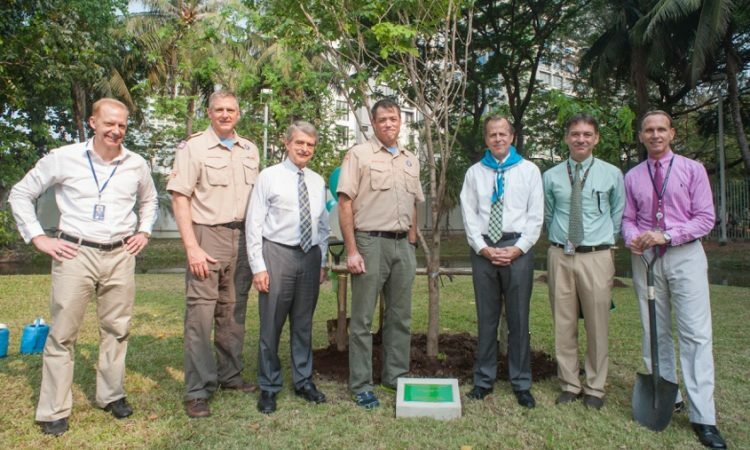 Ambassador Davies also toured the school and planted a tree. 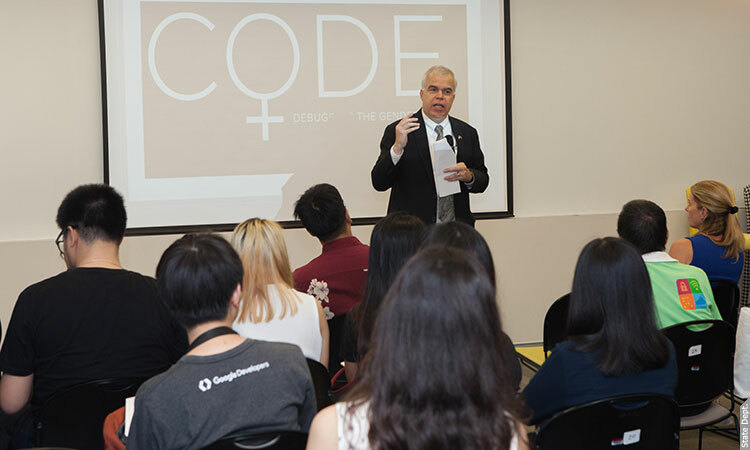 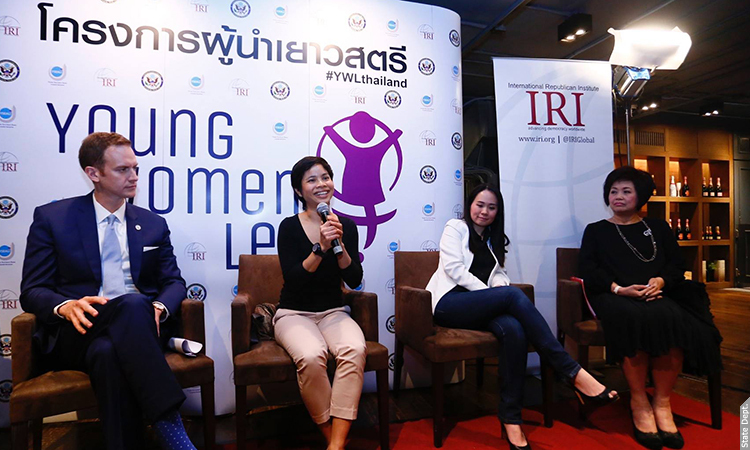 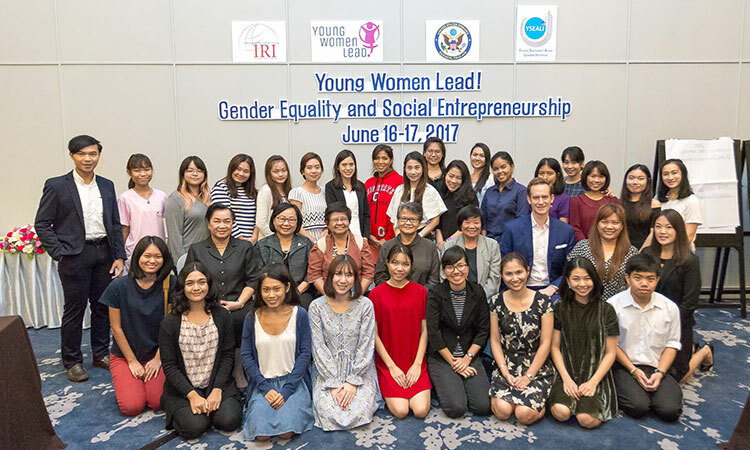 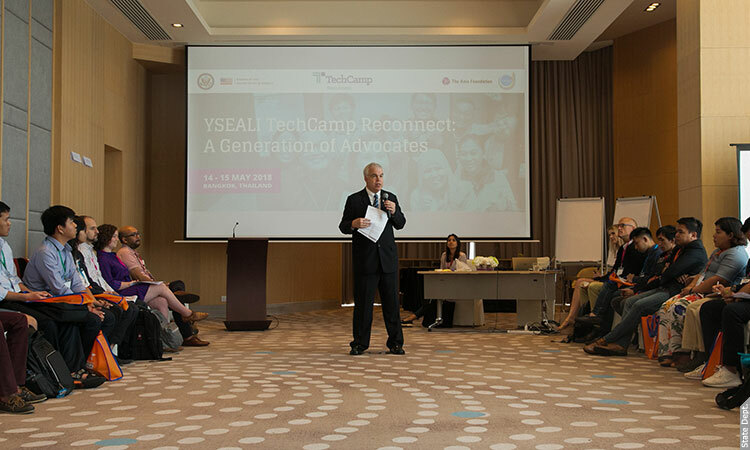 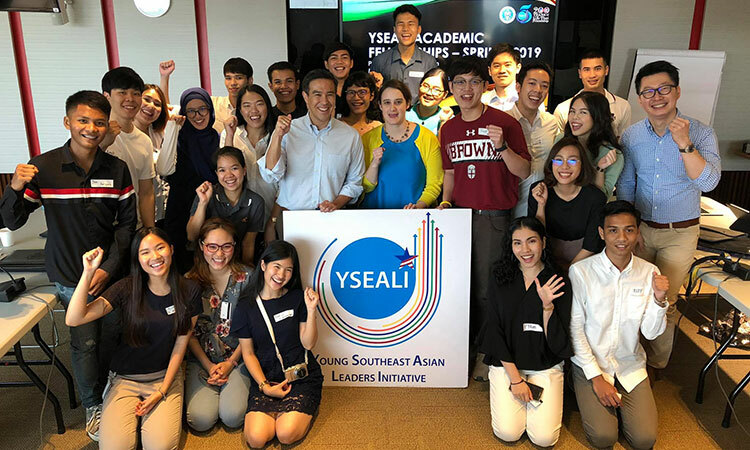 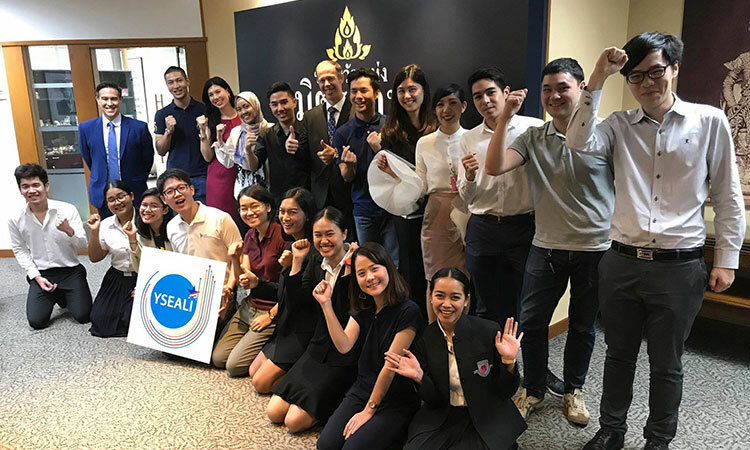 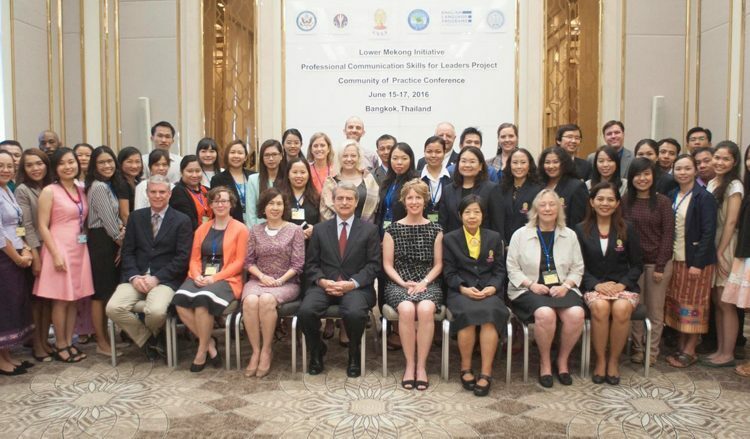 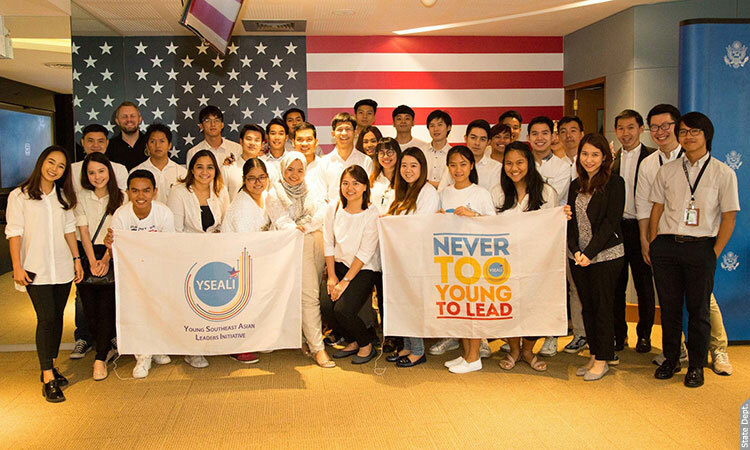 More than 50 participants, aged between 18-30 recently participated in the U.S. Embassy sponsored two-day Young Women Lead workshop in Bangkok. 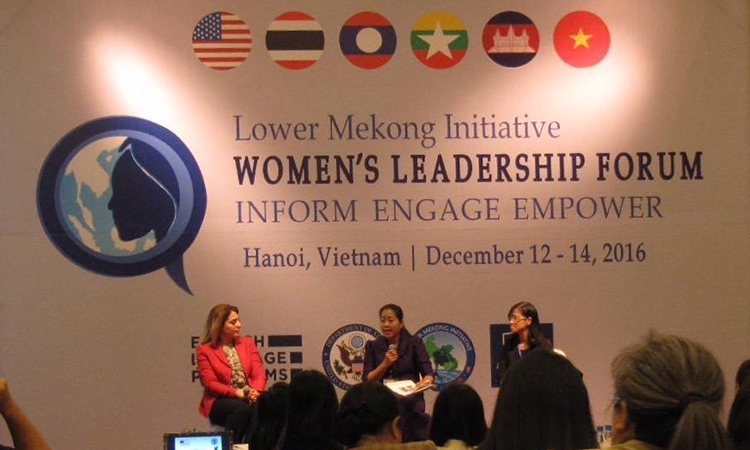 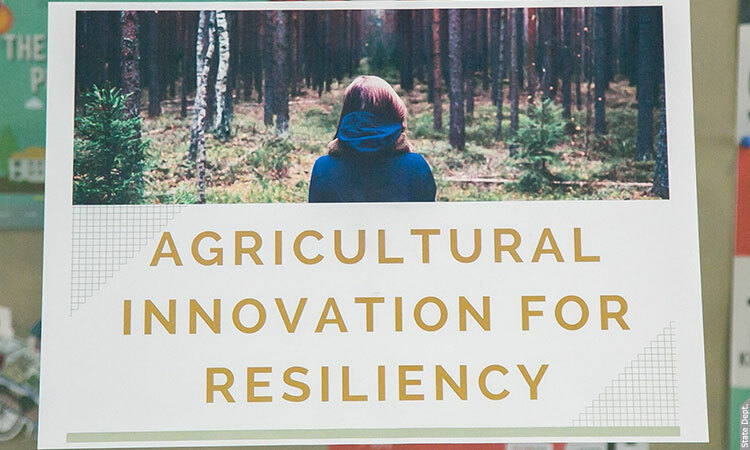 The workshop explored the themes of gender equality, advocacy and social entrepreneurship. 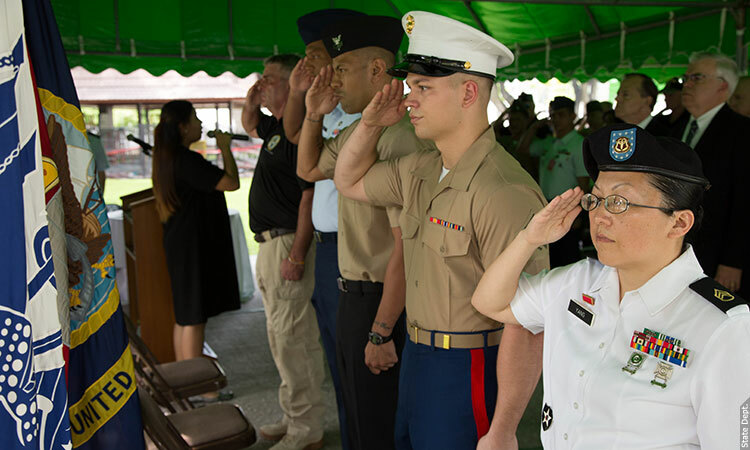 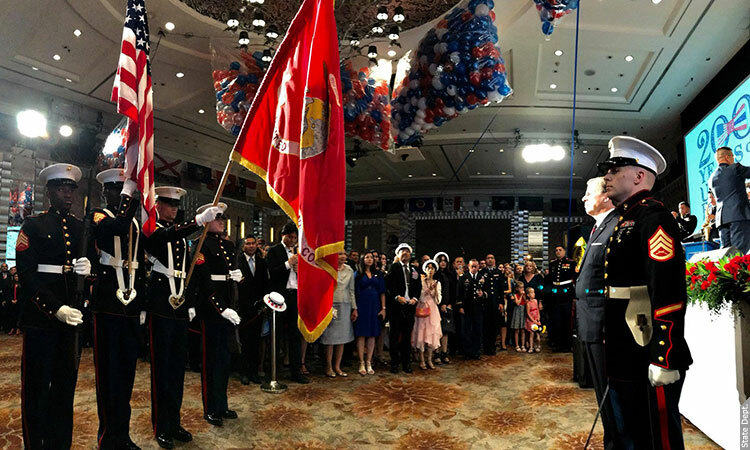 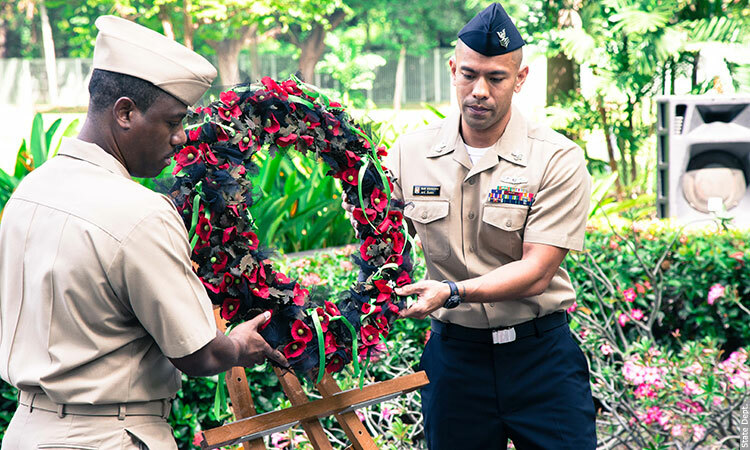 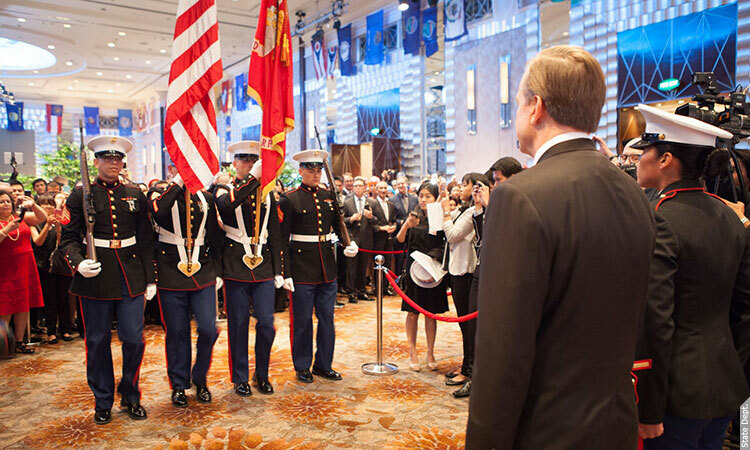 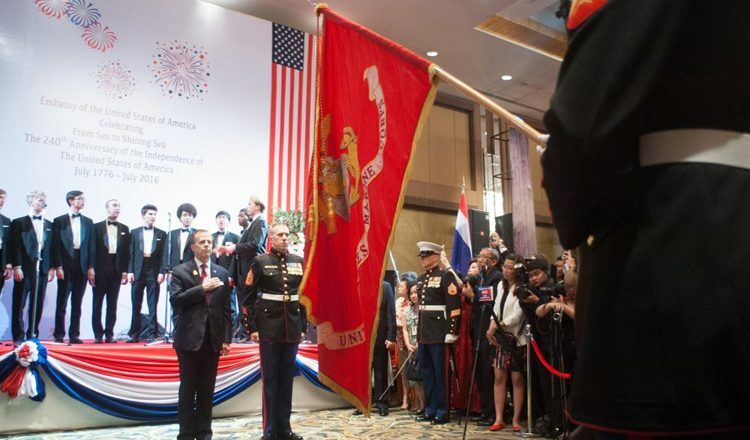 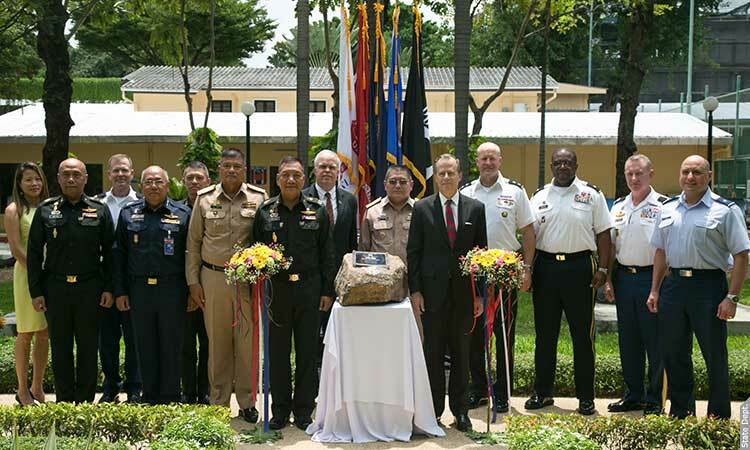 U.S. Embassy Bangkok held a Memorial Day Ceremony on May 26 to commemorate the commitment of members of America’s armed services and to honor those veterans who gave the ultimate sacrifice for our country. 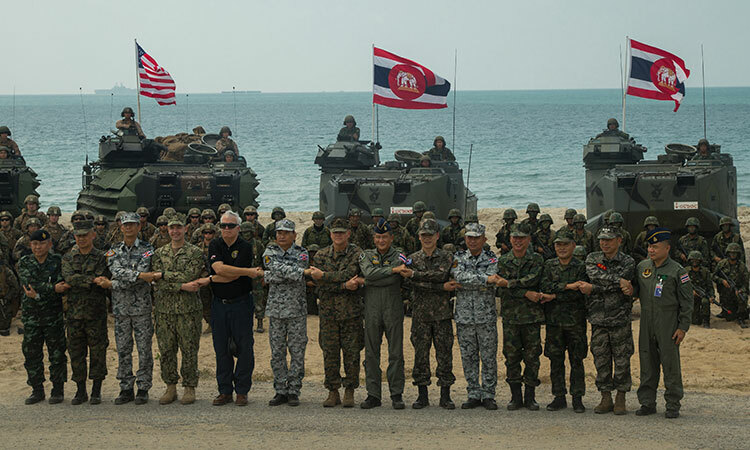 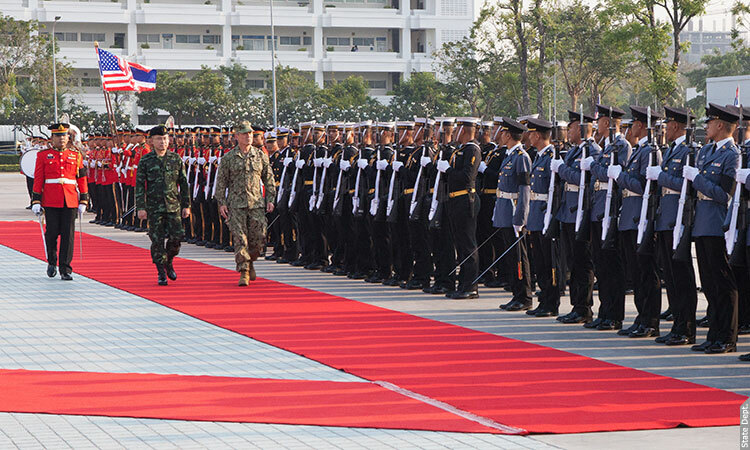 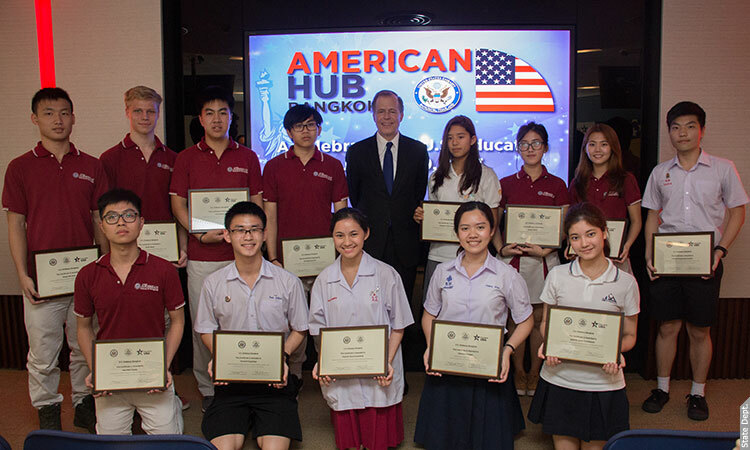 A group of military students from the Army Training Command Language Center visited the American Hub on Wednesday, May 17 to learn about American culture and Thai-U.S. relations. 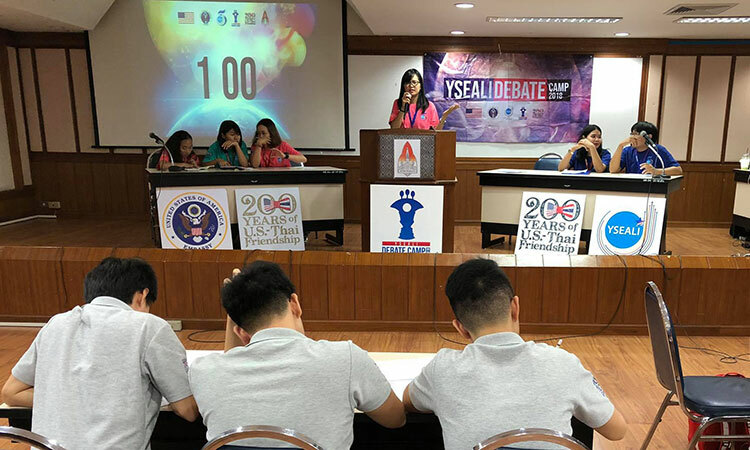 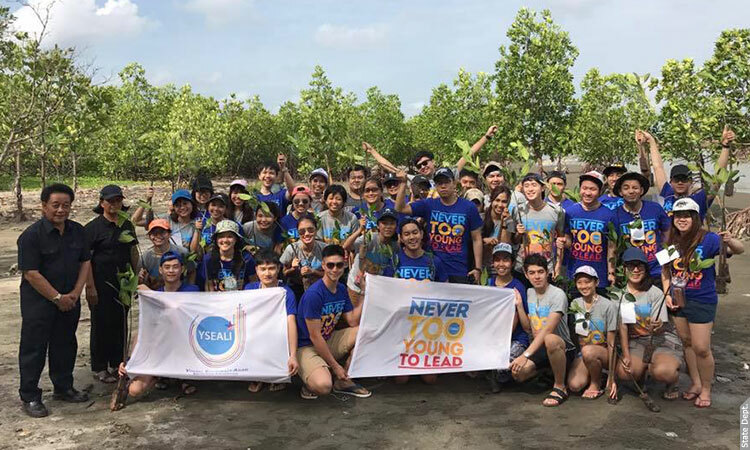 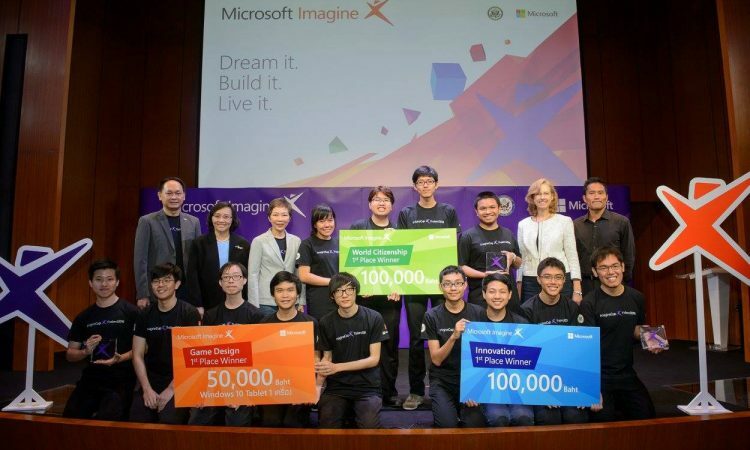 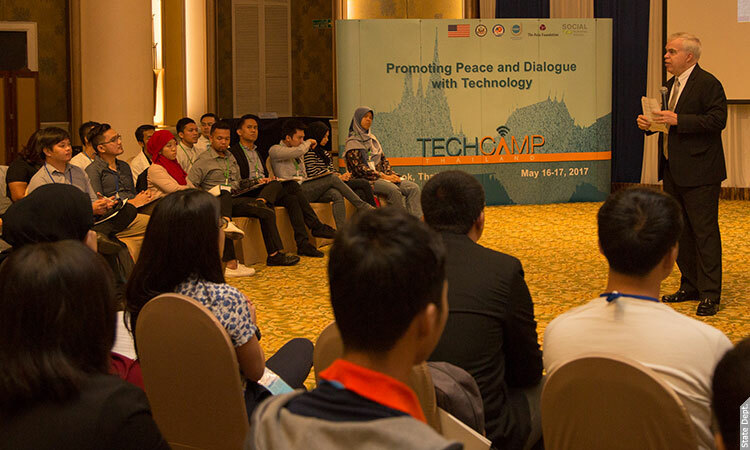 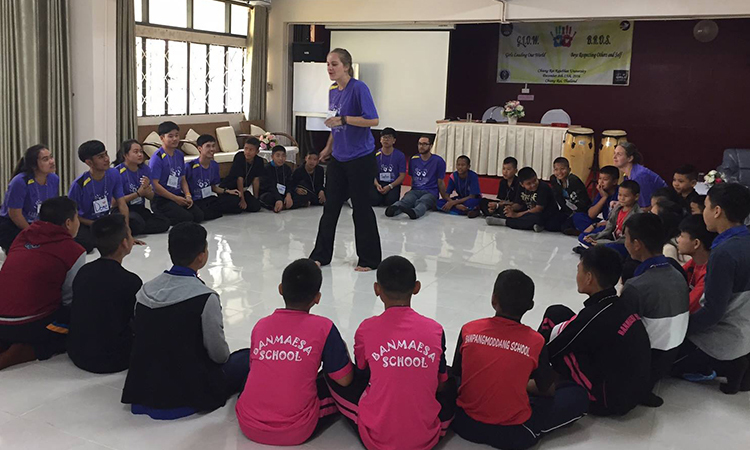 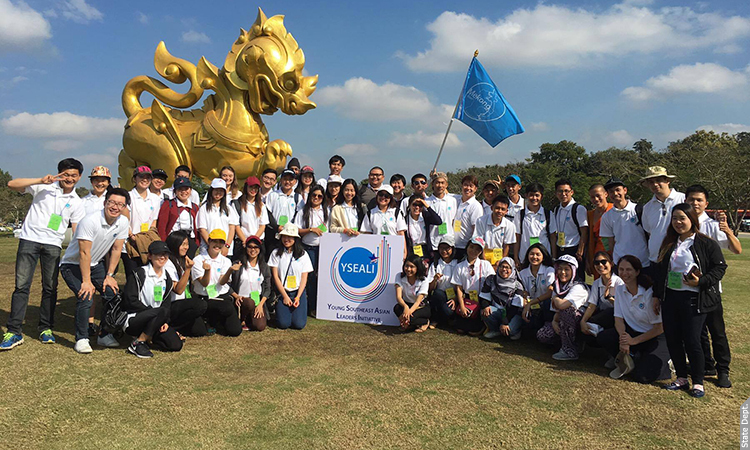 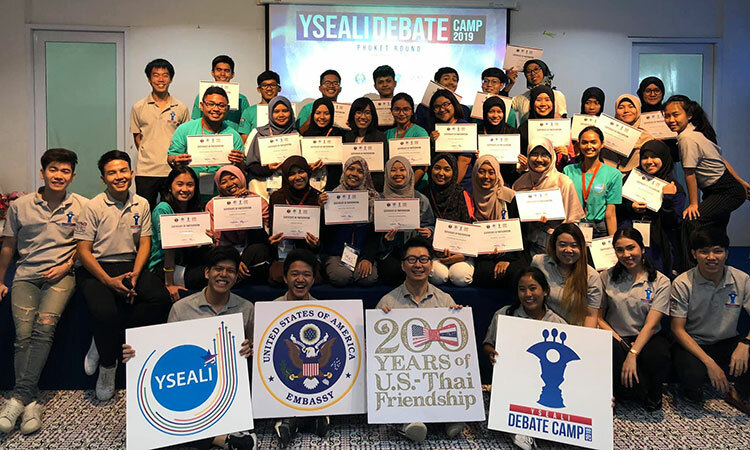 The students are part of an American English curriculum.They also learned about opportunities through the Young Southeast Asian Leaders Initiative (YSEALI) and EducationUSA. 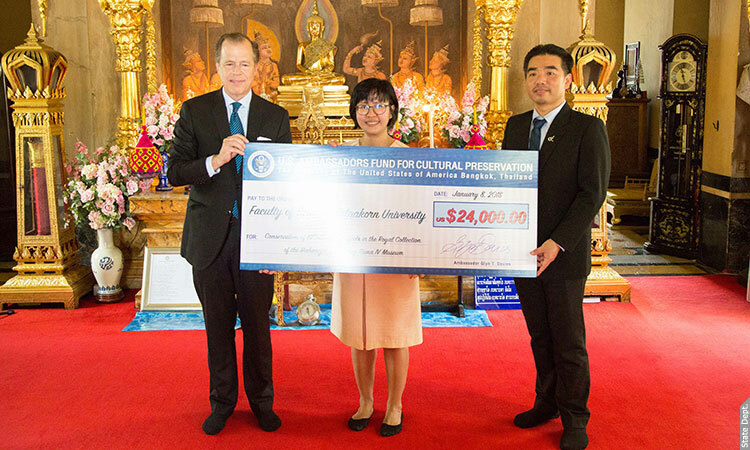 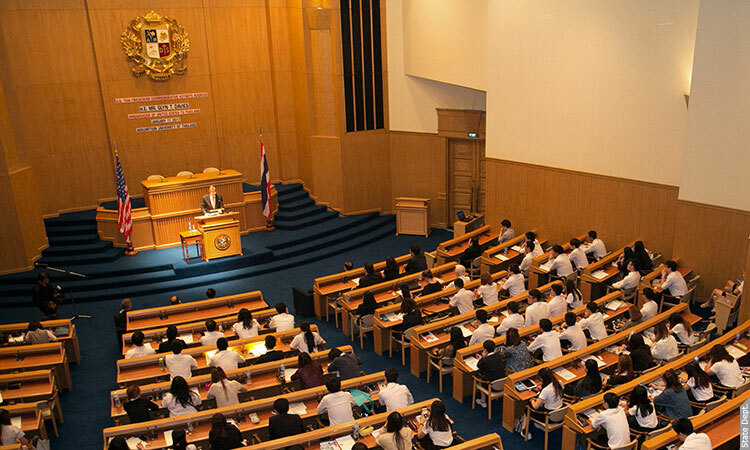 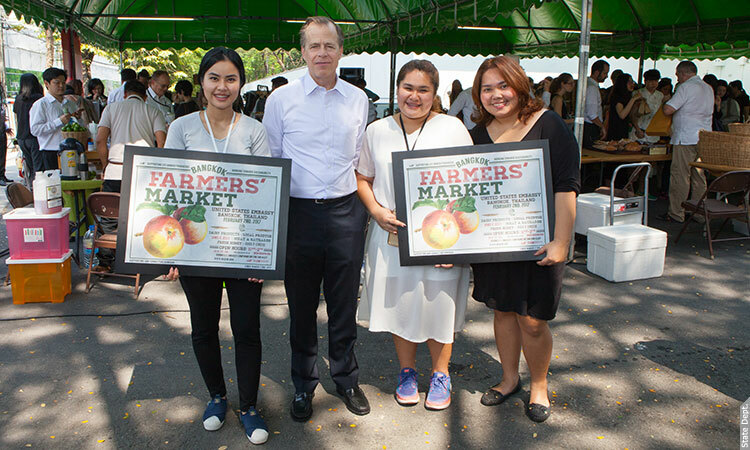 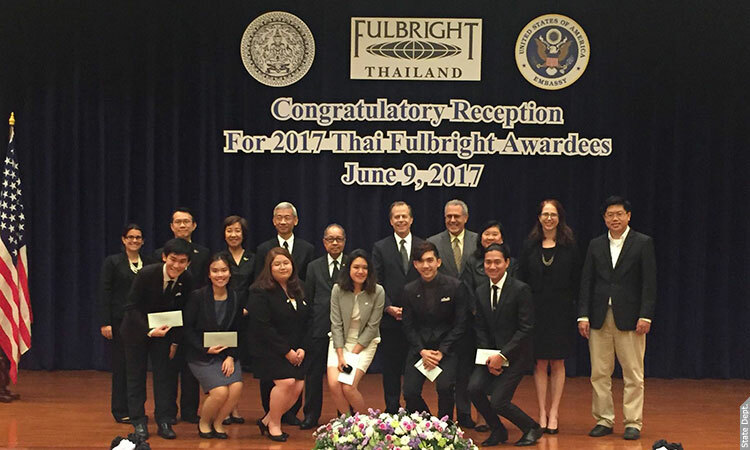 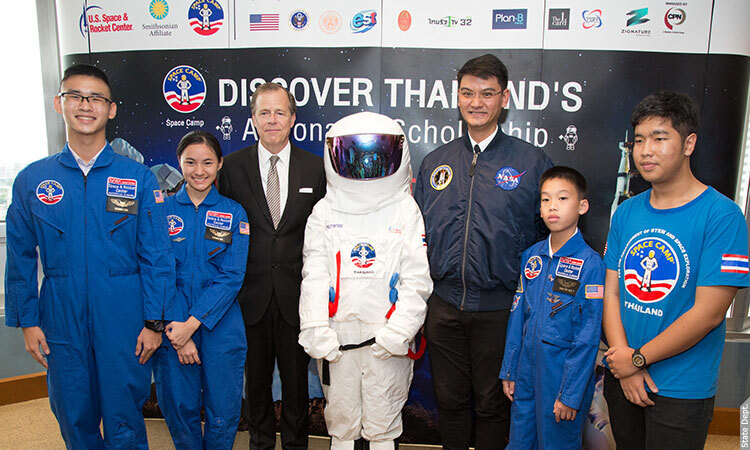 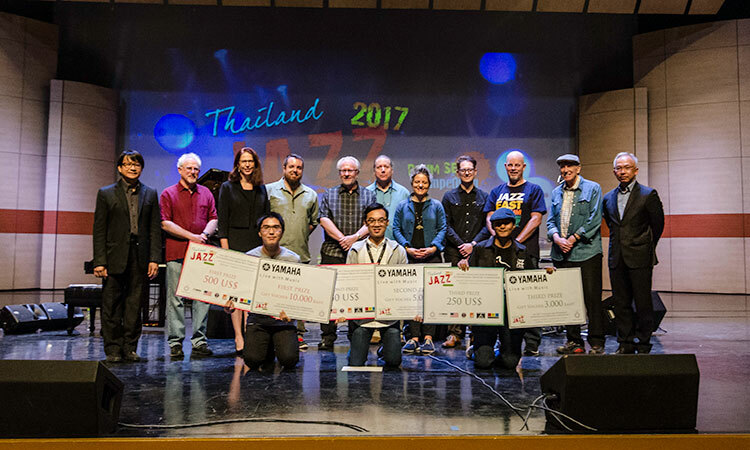 On May 4, Deputy Chief of Mission Peter Haymond congratulated fourteen Thai students on receiving scholarships to study in U.S. high schools next year. 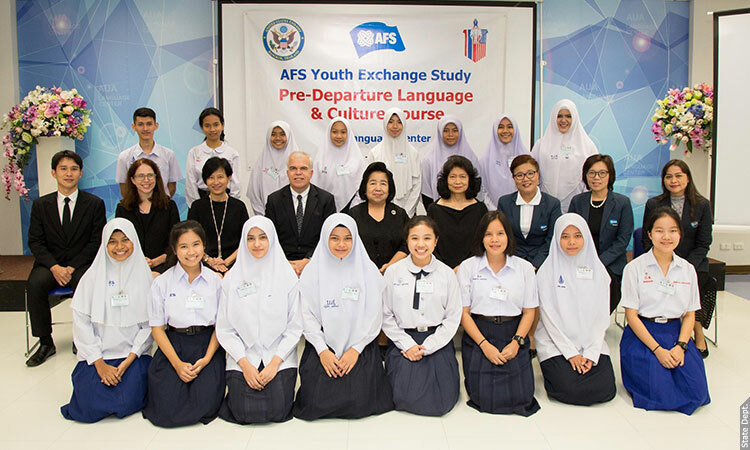 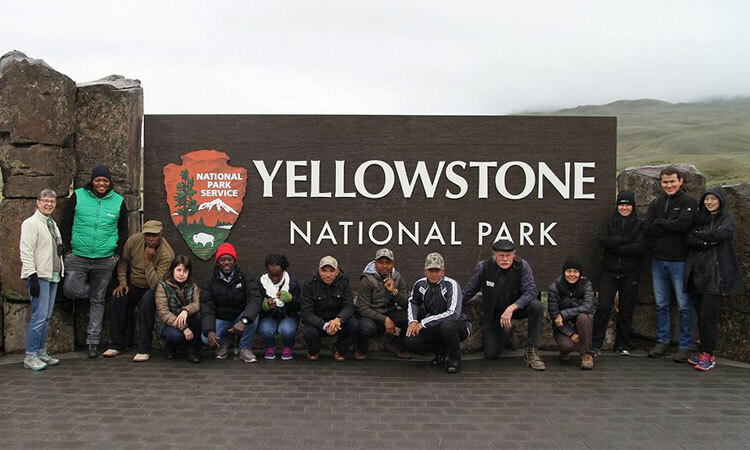 The students are part of the Youth, Exchange and Study (YES) program, organized by the American Field Service (AFS). 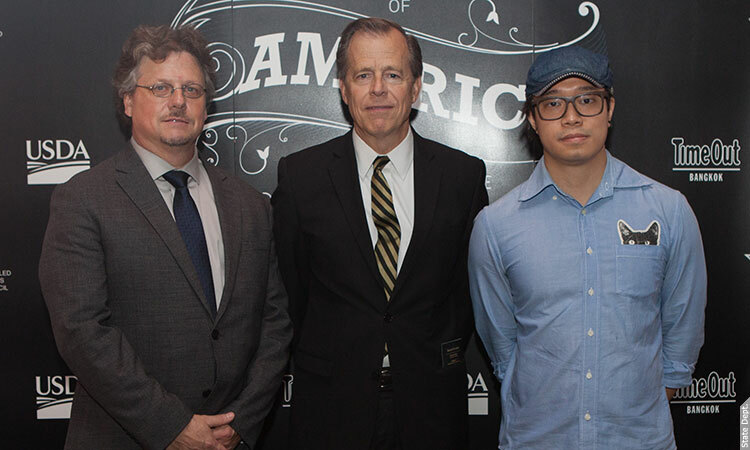 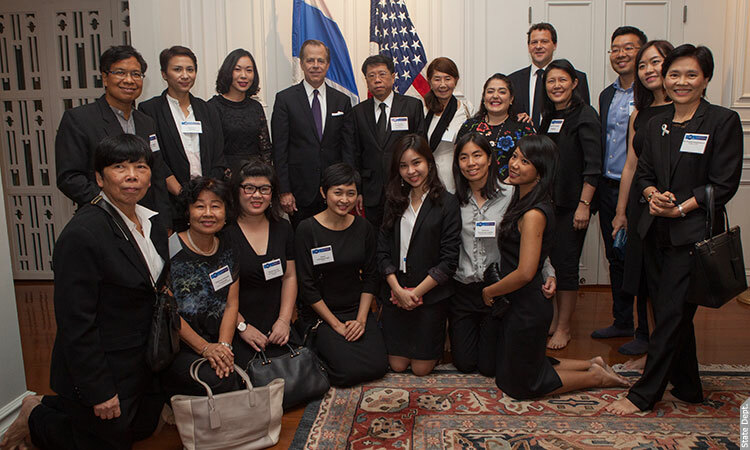 On April 26, Ambassador Glyn Davies hosted alumni from Columbia University’s Teachers College at a reception to celebrate Thai-U.S. educational cooperation. 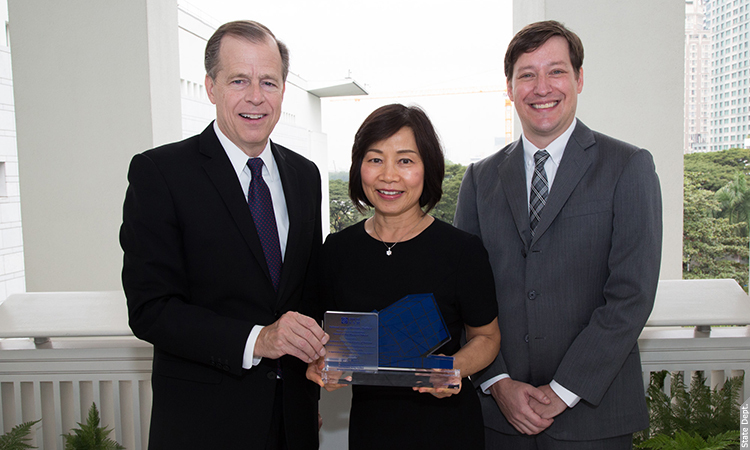 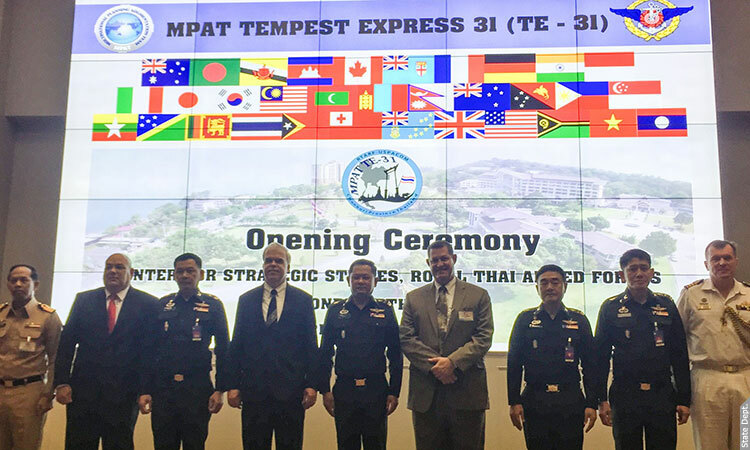 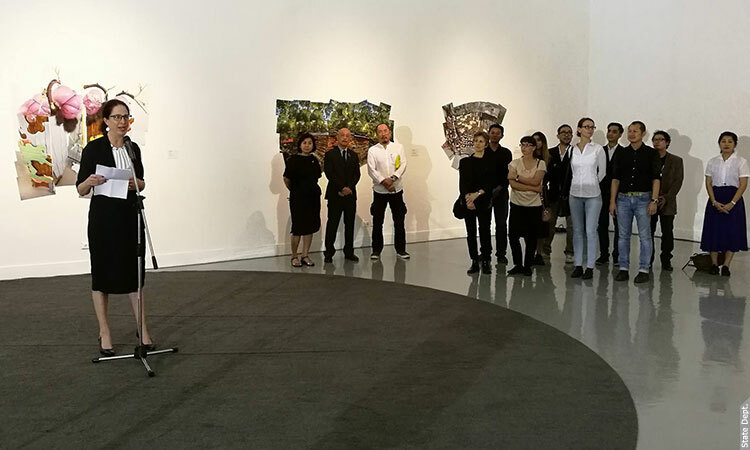 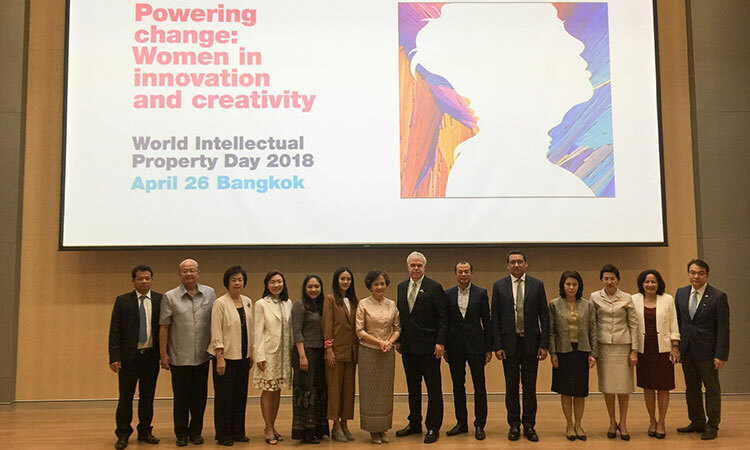 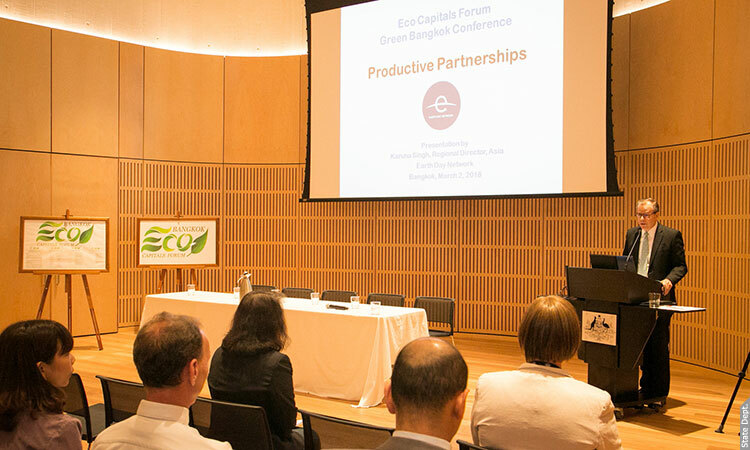 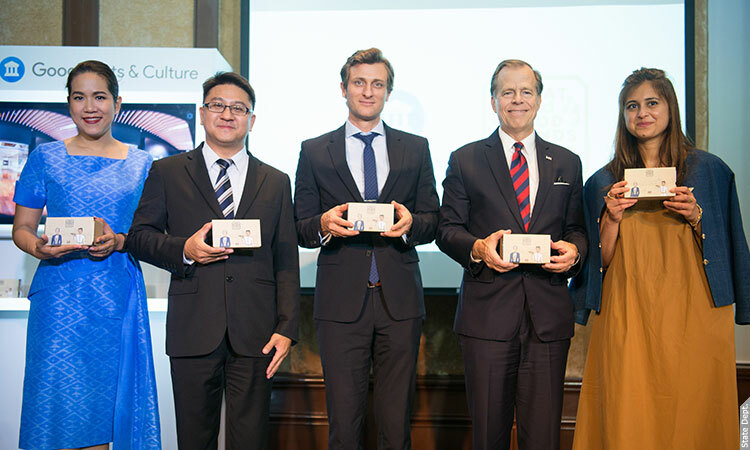 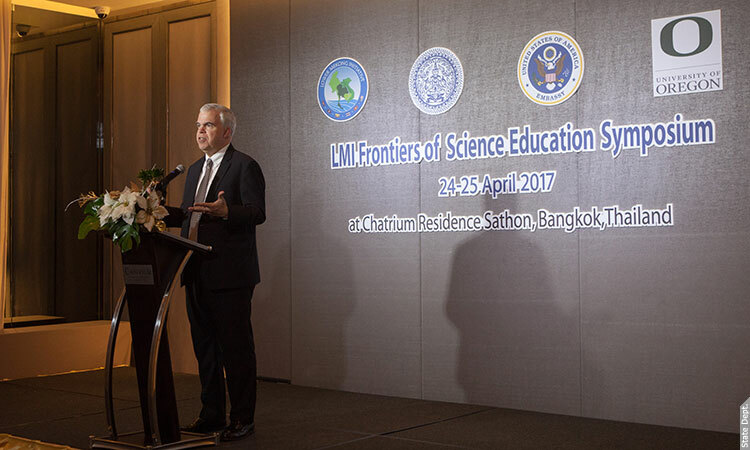 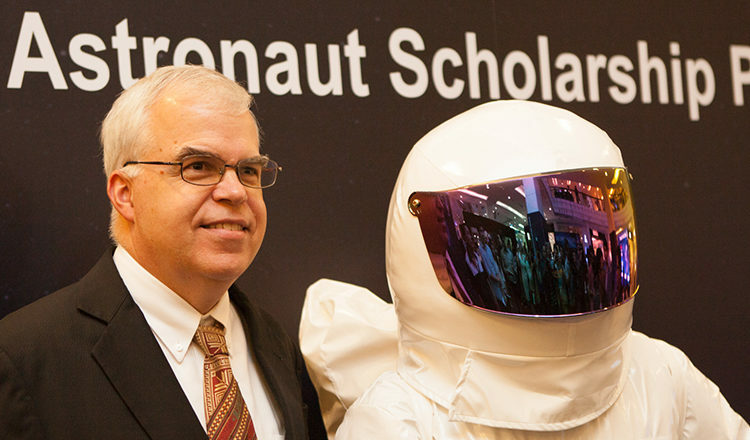 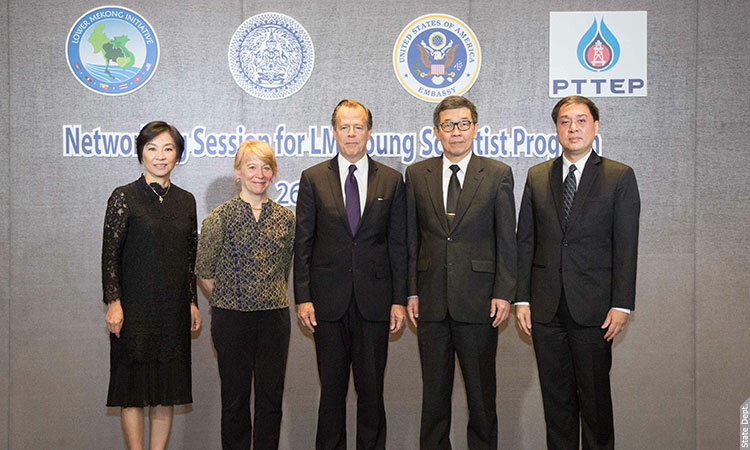 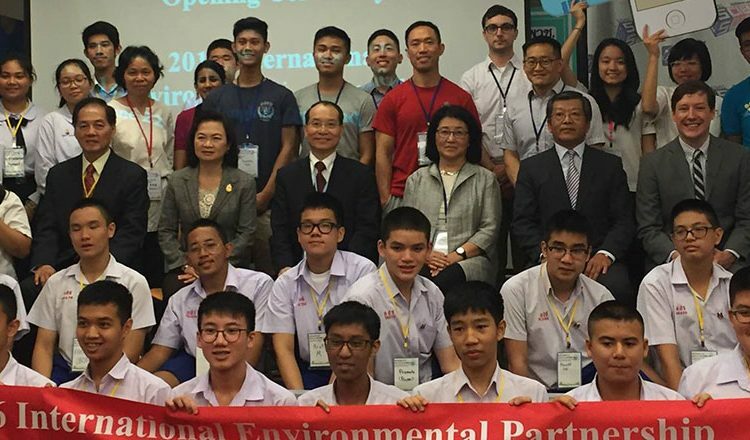 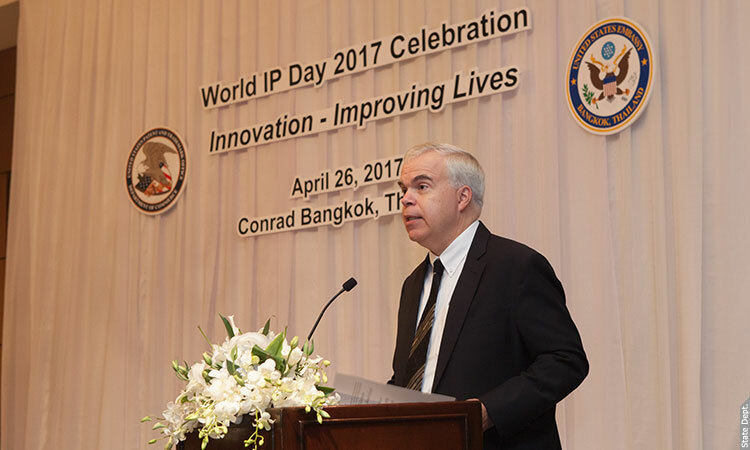 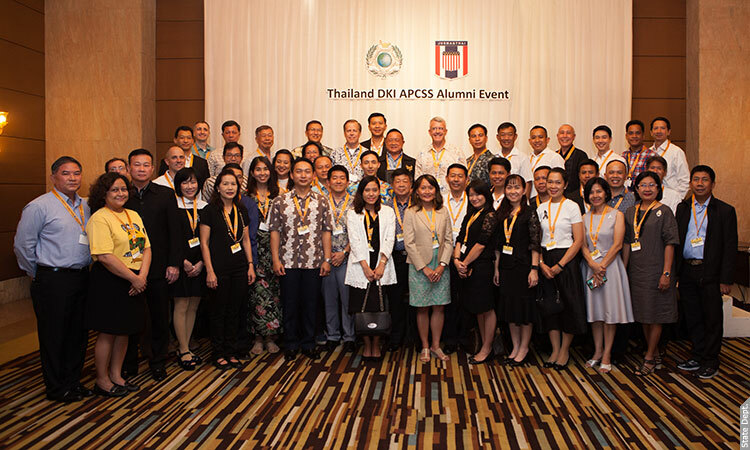 Ambassador Davies spoke about the importance of the Thai-U.S. educational relationship and the U.S. Embassy’s support for ongoing educational development in Thailand, especially in the fields of Science, Technology, Engineering, and Mathematics (STEM). 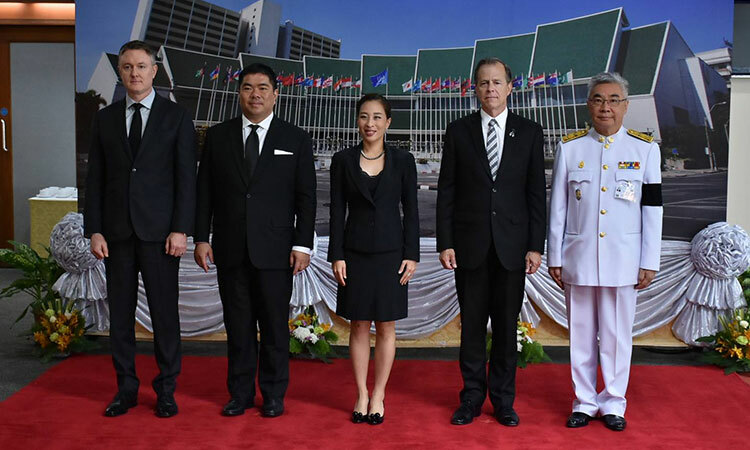 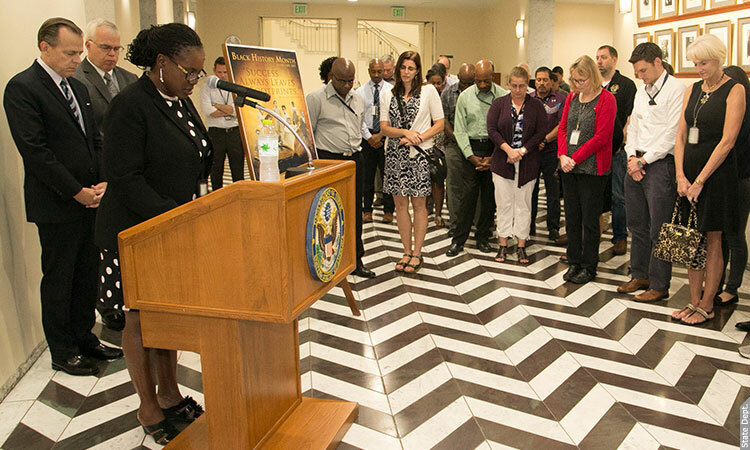 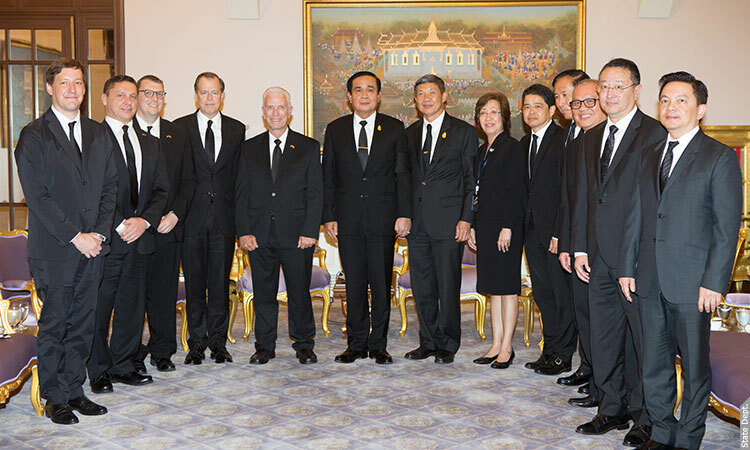 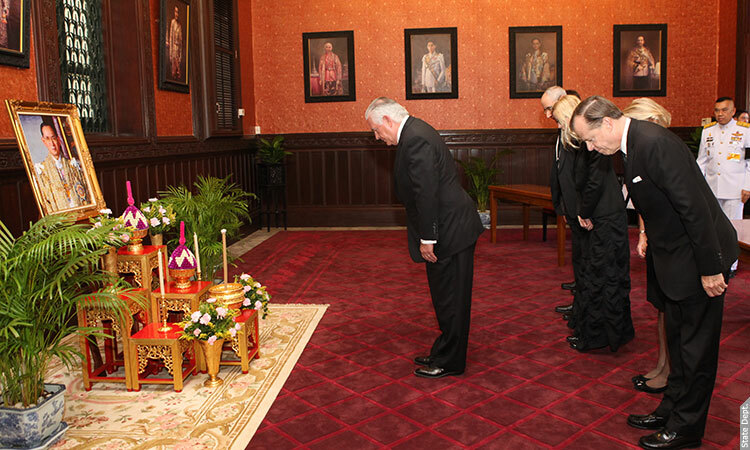 Ambassador Davies led two hundred U.S. Embassy staff and family members April 1 to pay respects to His Late Majesty King Bhumibol Adulyadej at the Dusit Throne Hall of the Grand Palace. 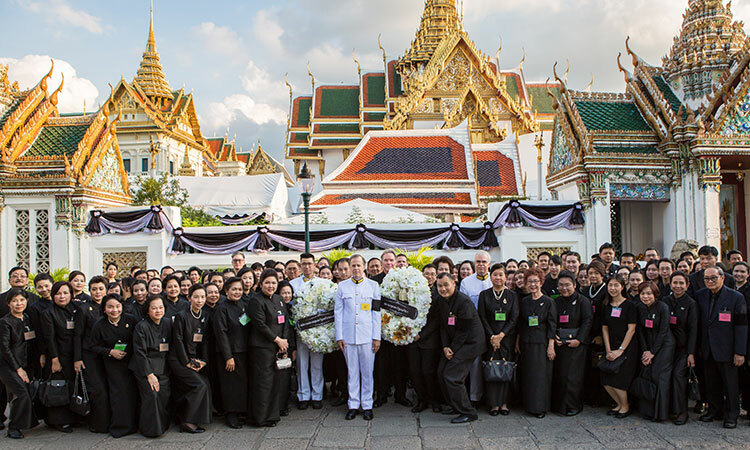 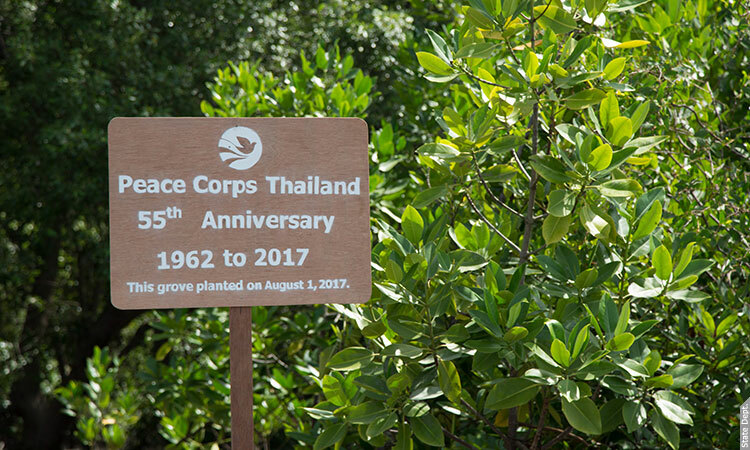 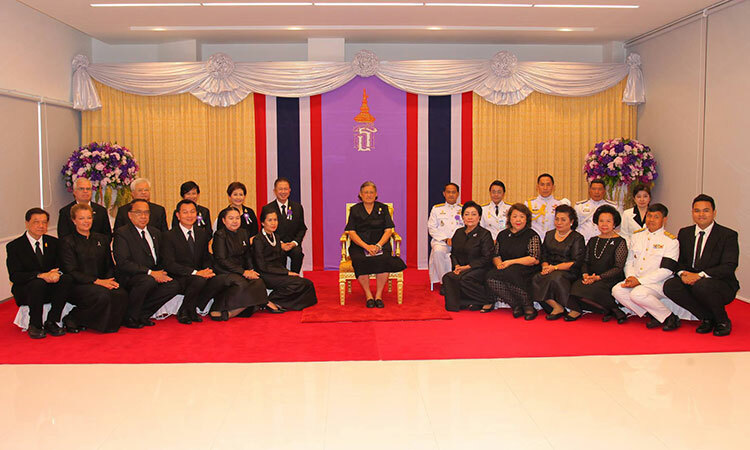 The ceremony was to join the Thai nation in mourning the passing of King Rama IX on October 13, 2016. 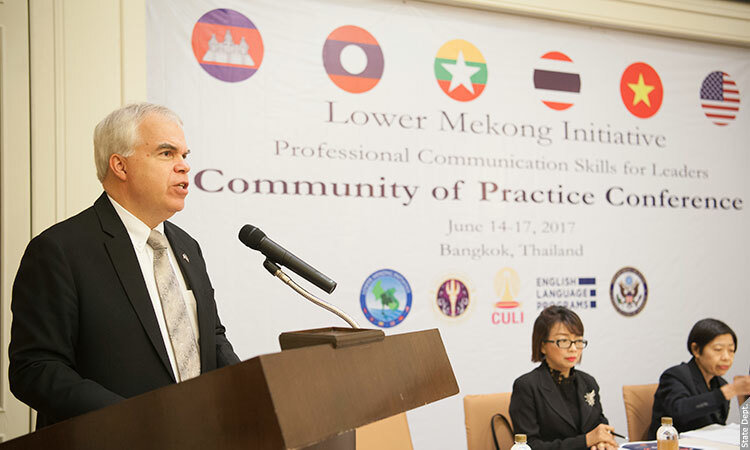 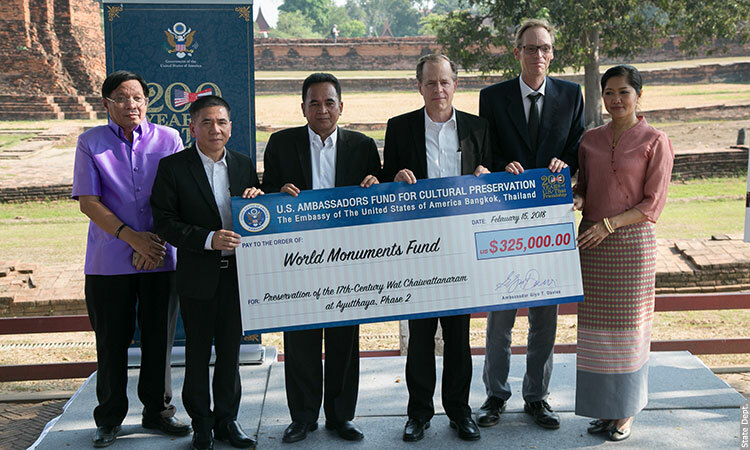 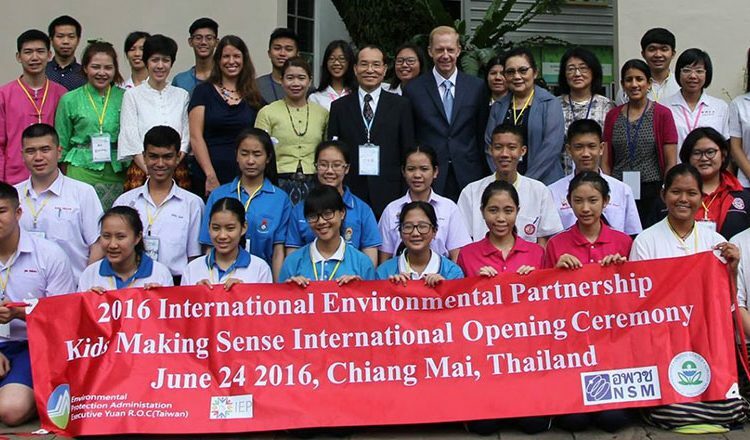 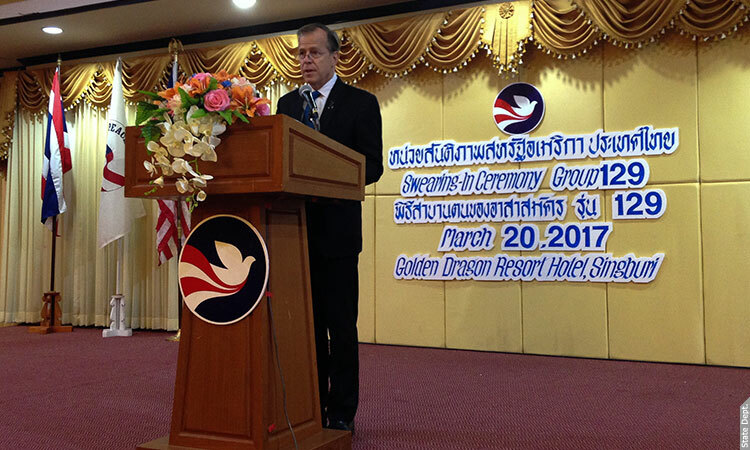 Deputy Chief of Mission Peter Haymond congratulated graduates of Wat Arun’s Community Learning Center at a ceremony on March 31. 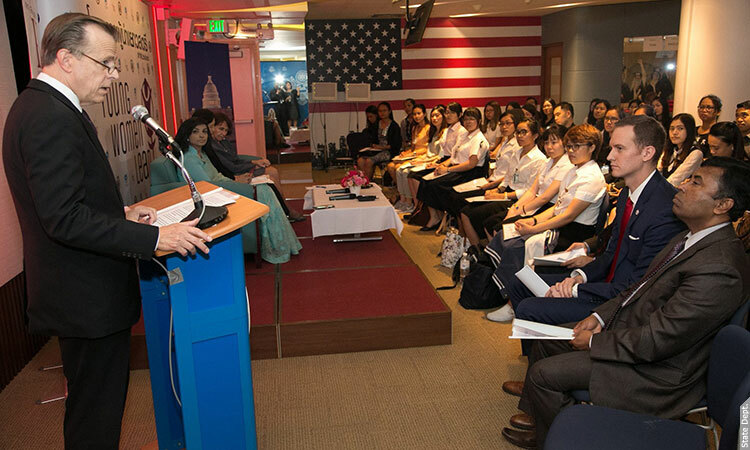 The young women graduates have been trained as nursing assistants. 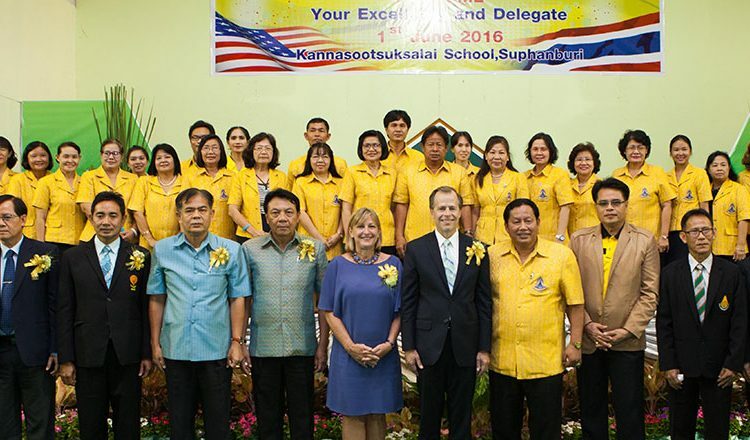 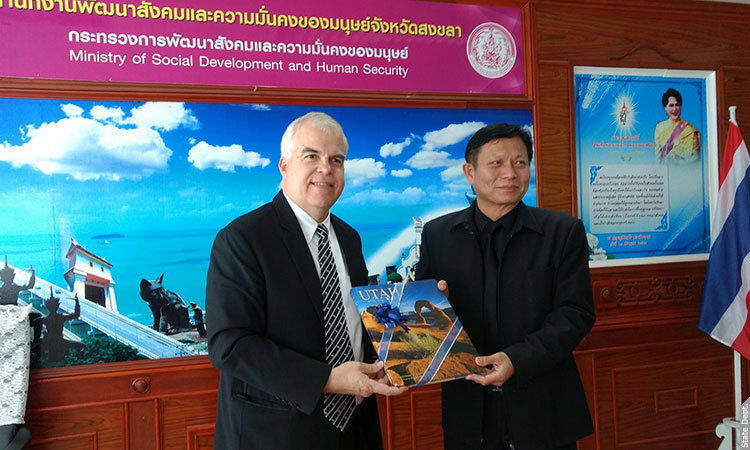 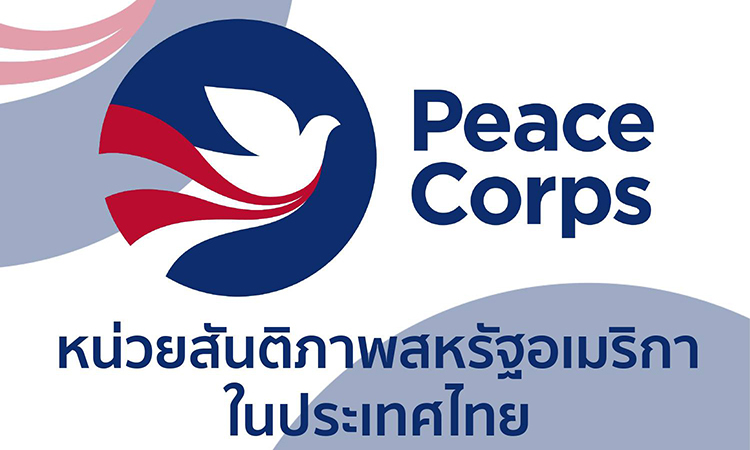 The school is funded by American philanthropists and supported by the Thai Ministry of Education. 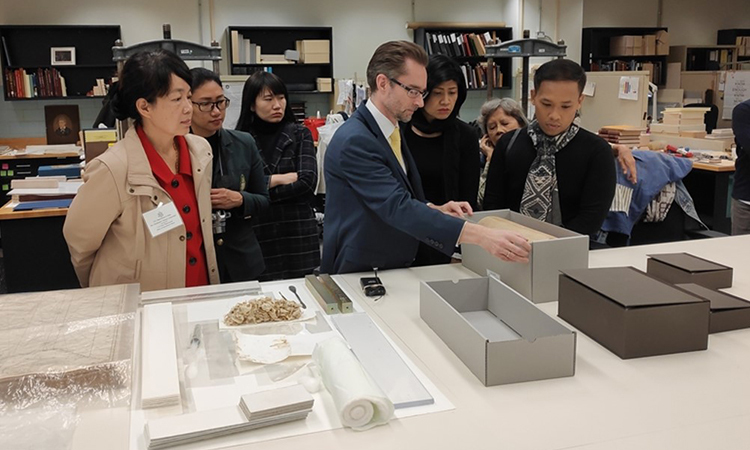 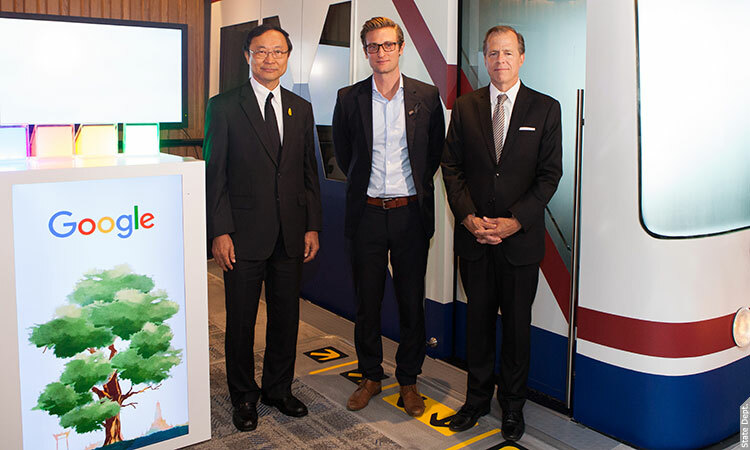 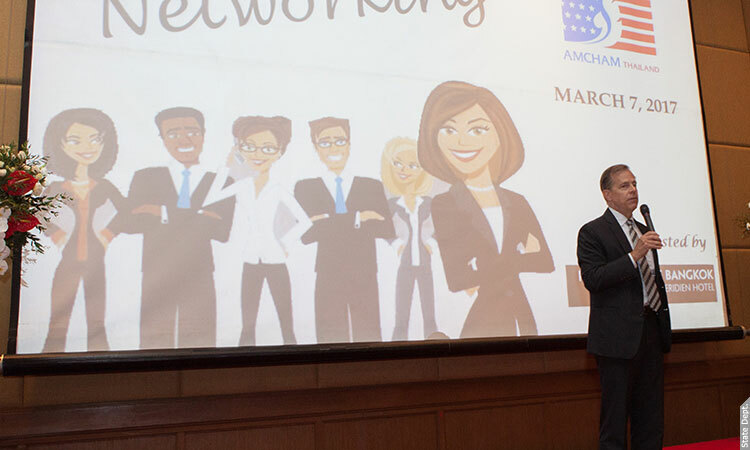 On March 7, AMCHAM hosted U.S. Embassy staff and AMCHAM members for a ‘Meet the Embassy’ event as a way to introduce Embassy officers to the members of the American business community. 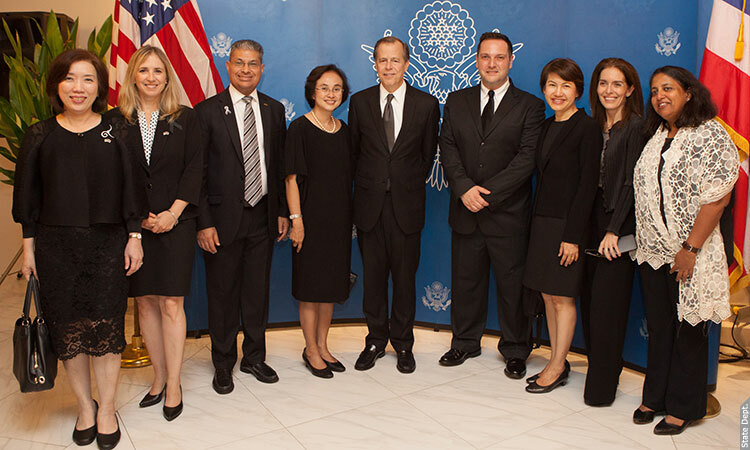 After the formal program, the AmCham monthly networking reception allowed American business to mingle with and get know Embassy presenters. 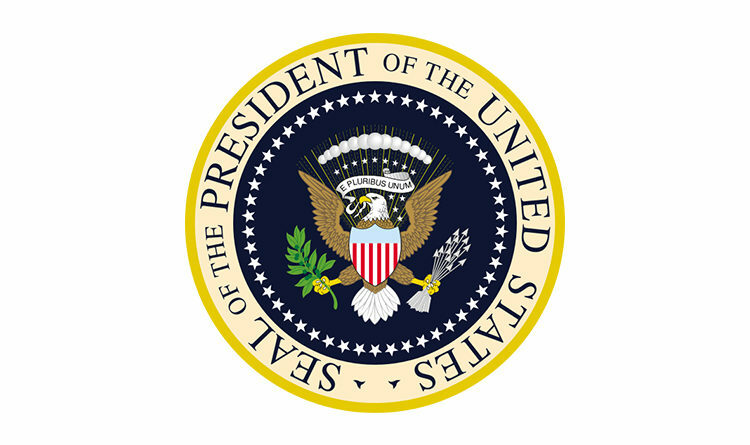 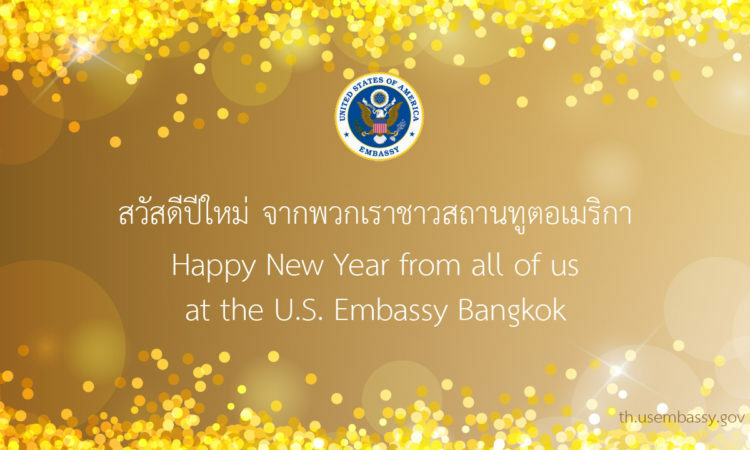 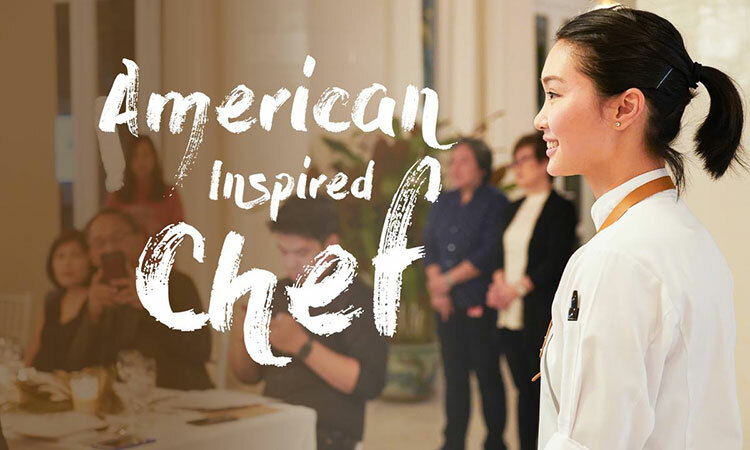 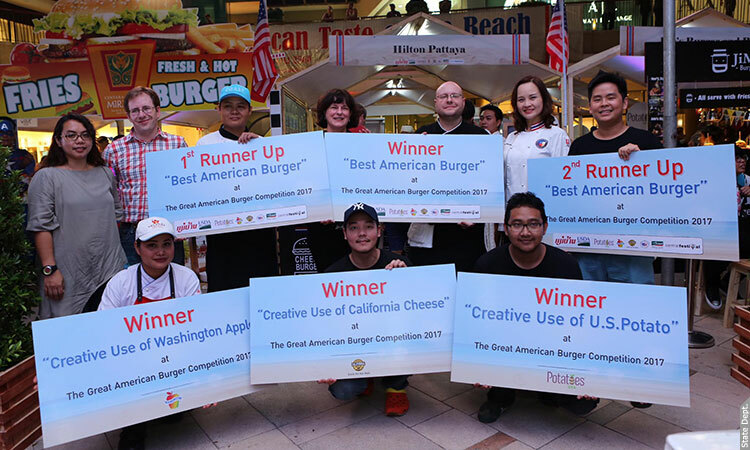 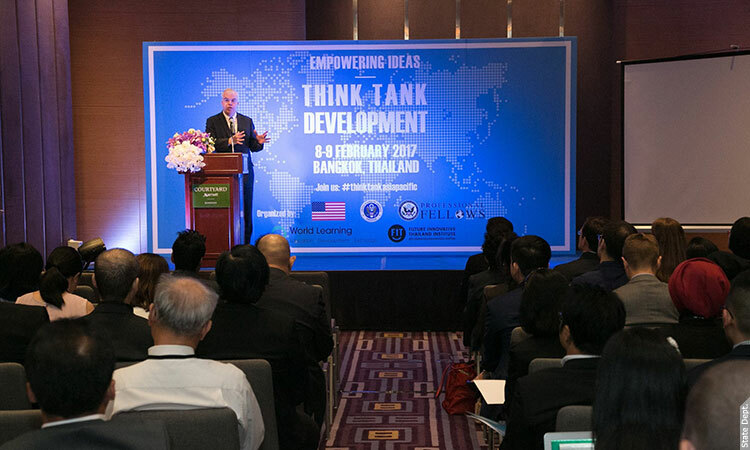 By U.S. Embassy Bangkok | 4 February, 2017 | Topics: Ambassador, Education, Events, News, Study in the U.S.
By U.S. Embassy Bangkok | 19 January, 2017 | Topics: Ambassador, Education, Events, News, Science & Tech, Study in the U.S.
On Tuesday, January 17, Ambassador Glyn Davies traveled to Assumption University, Suvarnabhumi Campus, to speak with students and faculty about the legacy of His Majesty King Bhumibol Adulyadej and the past, present, and future of U.S.-Thai relations. 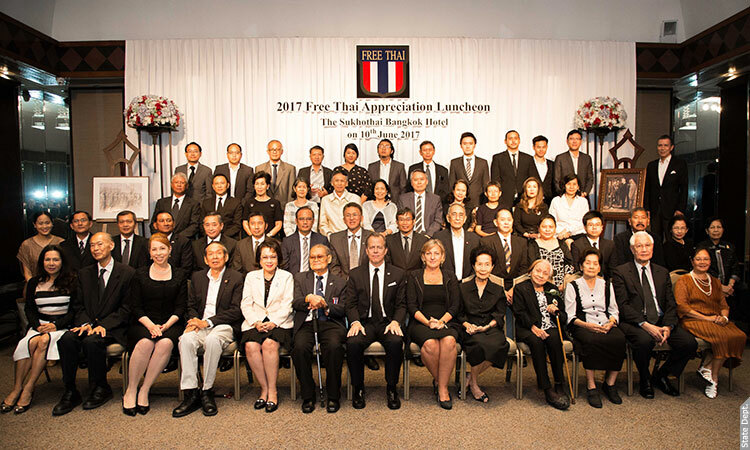 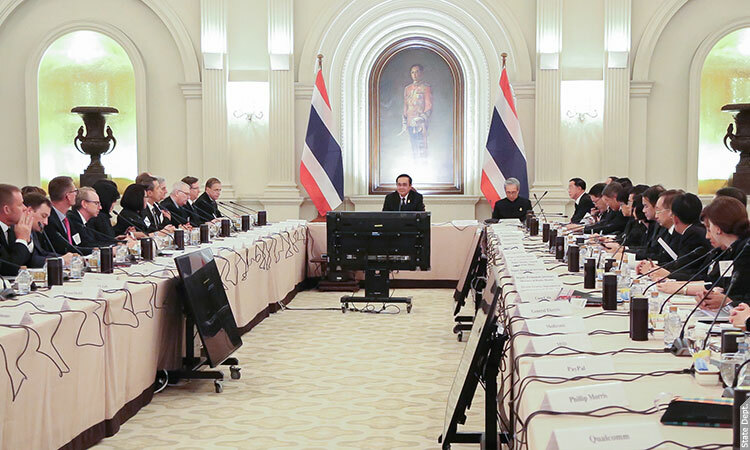 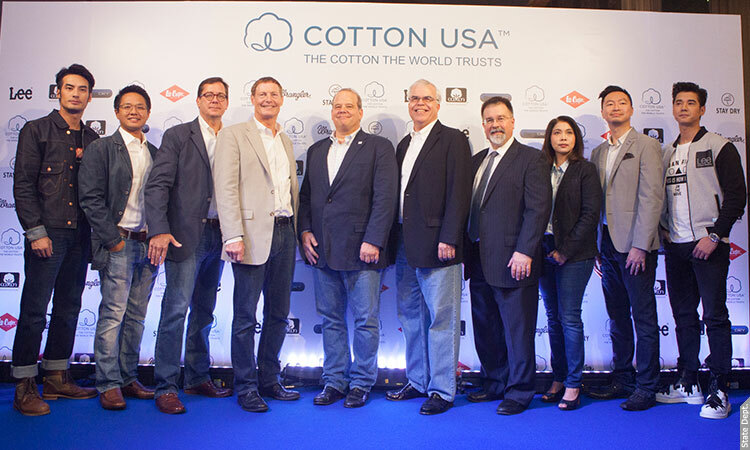 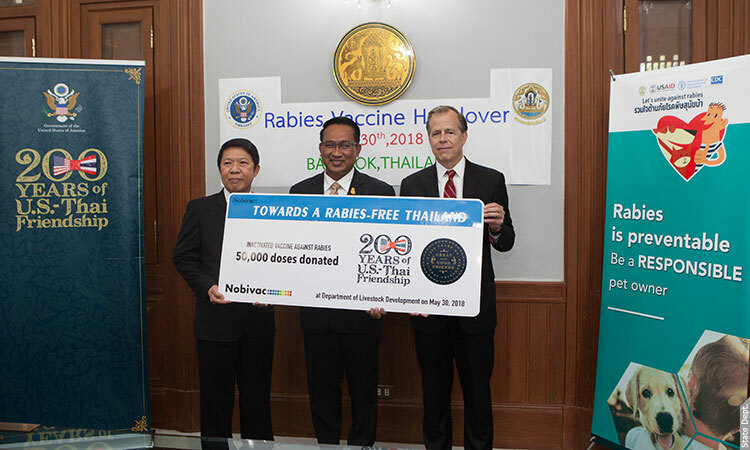 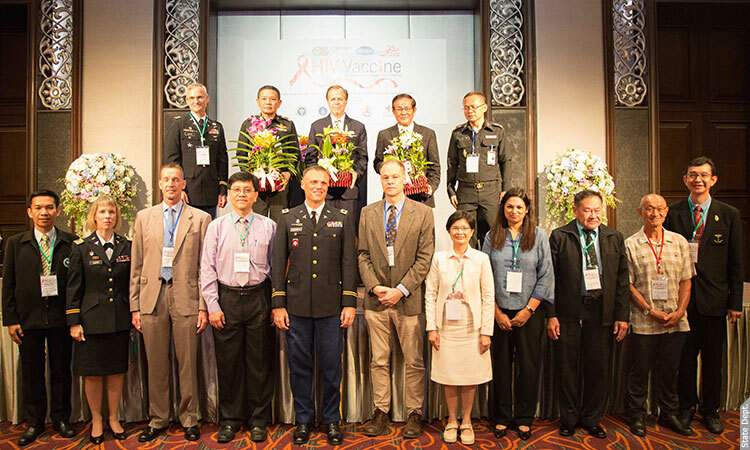 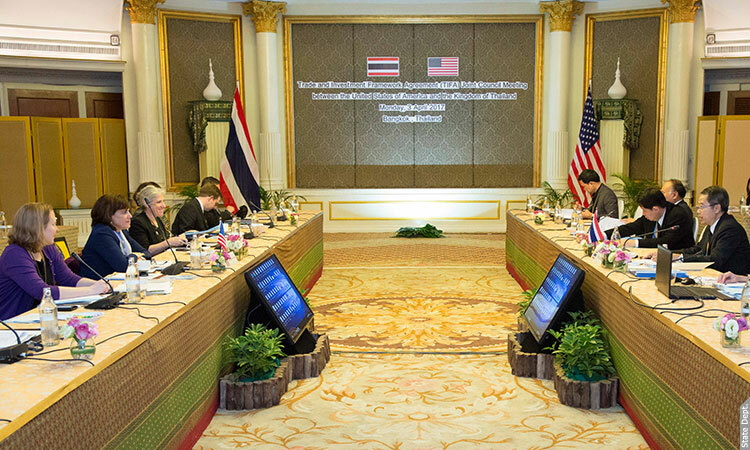 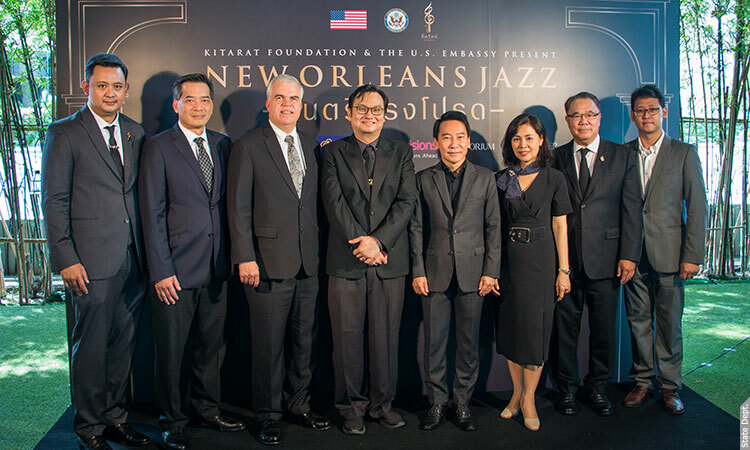 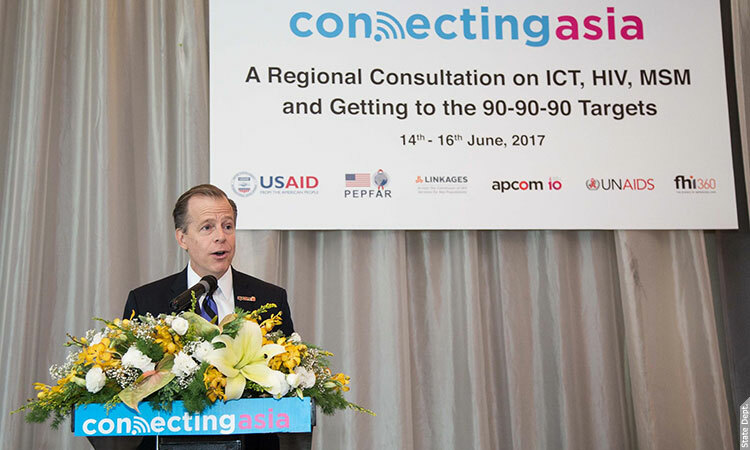 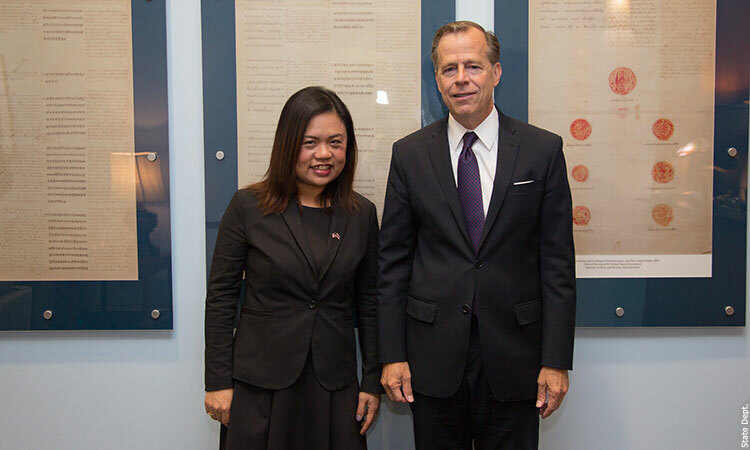 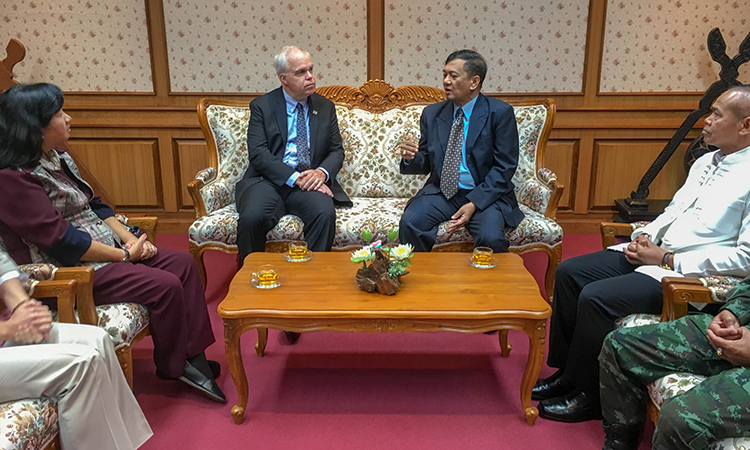 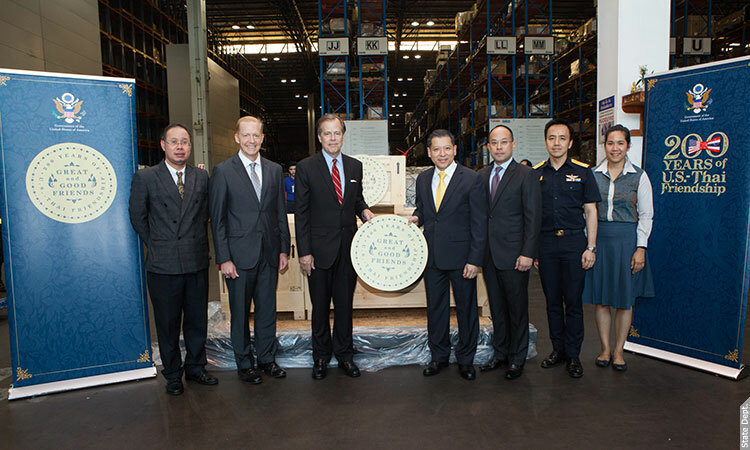 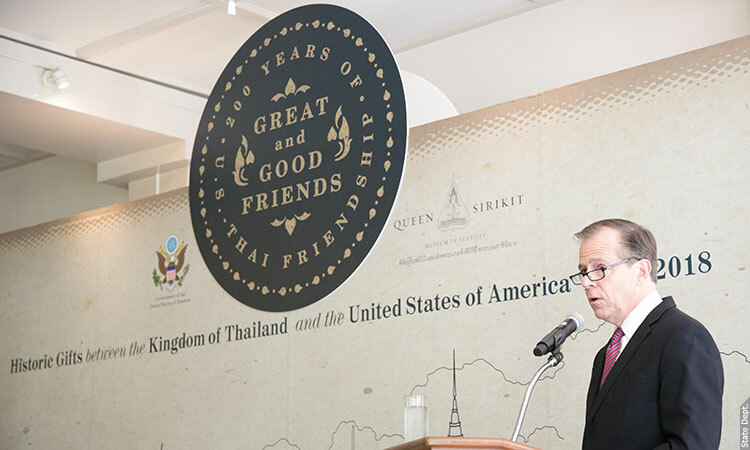 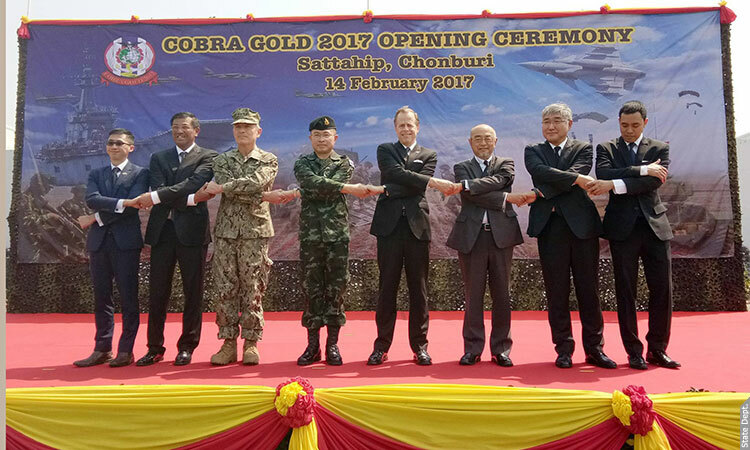 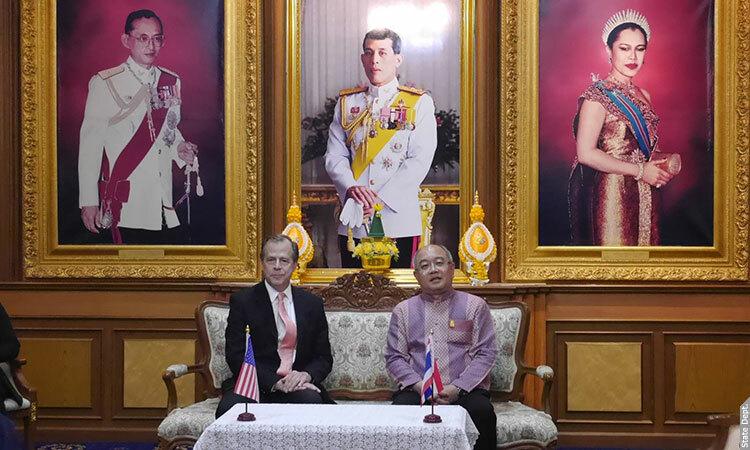 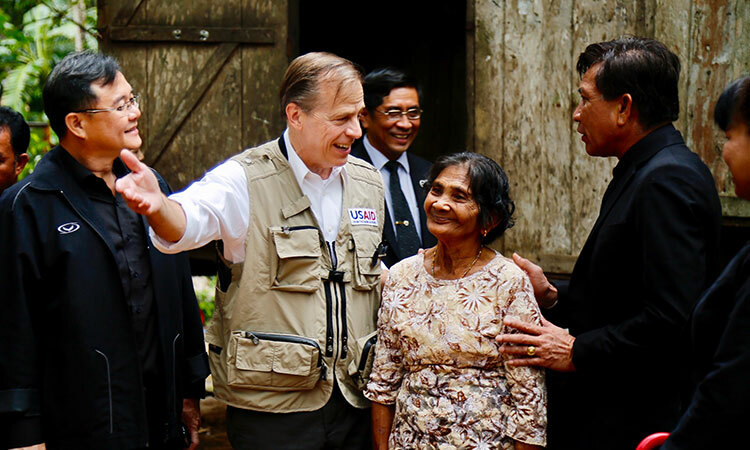 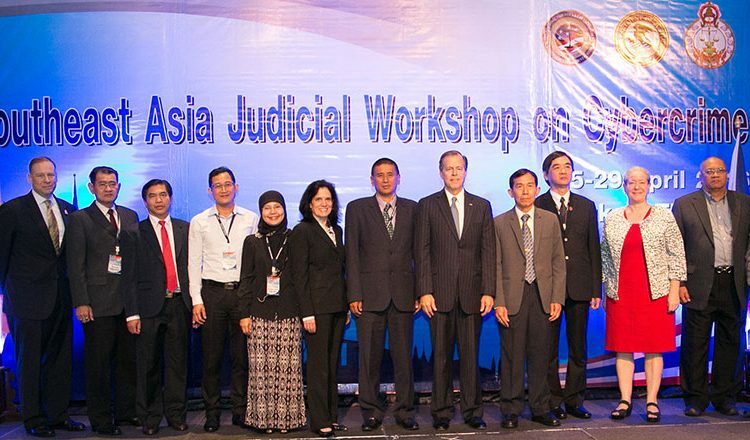 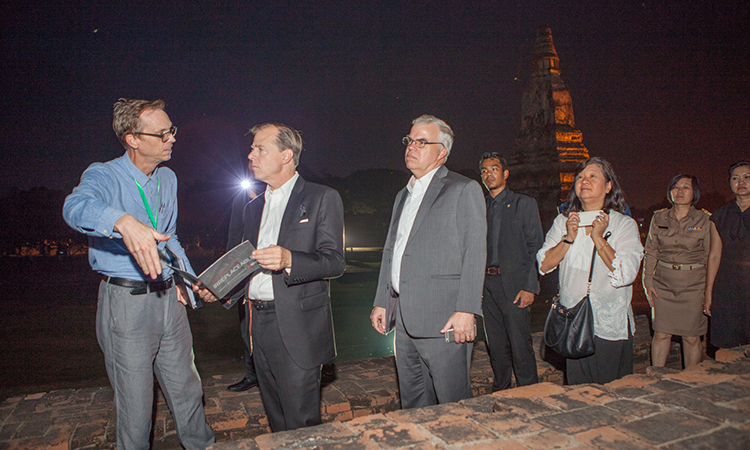 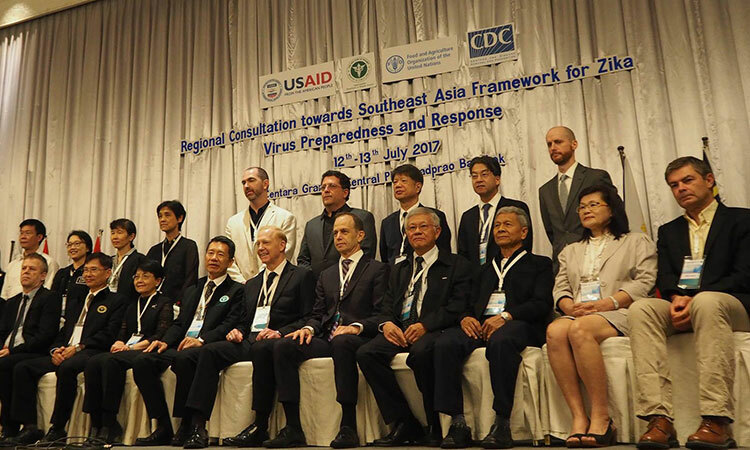 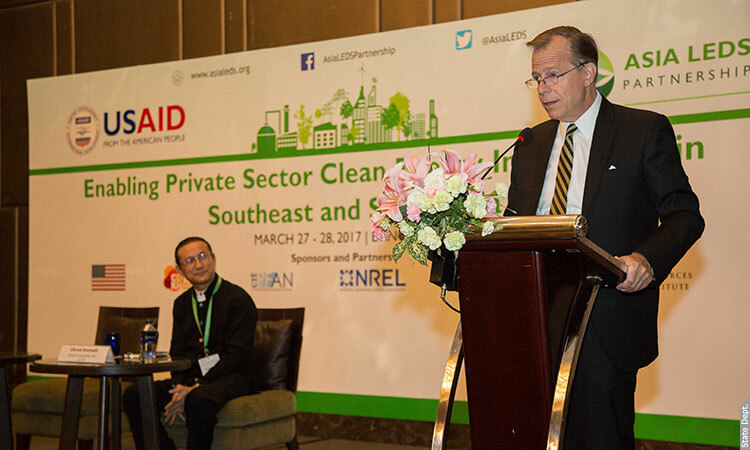 Ambassador Davies remarked that the U.S.-Thai relationship continues to deepen through various economic, health, education, and security-related initiatives. 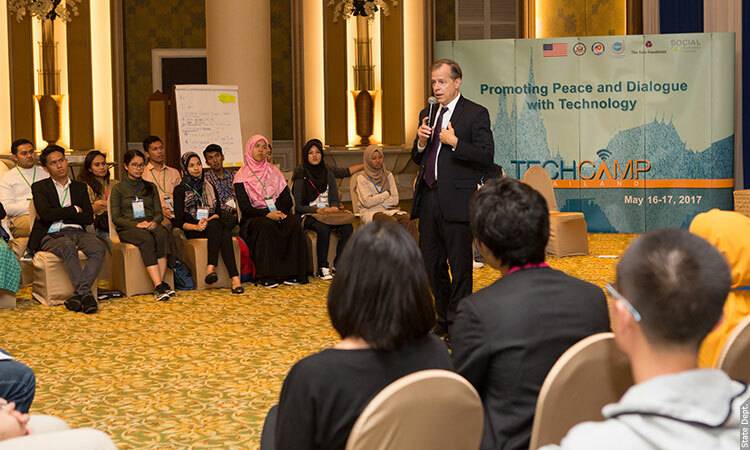 Civic Engagement is vital – especially for young people! 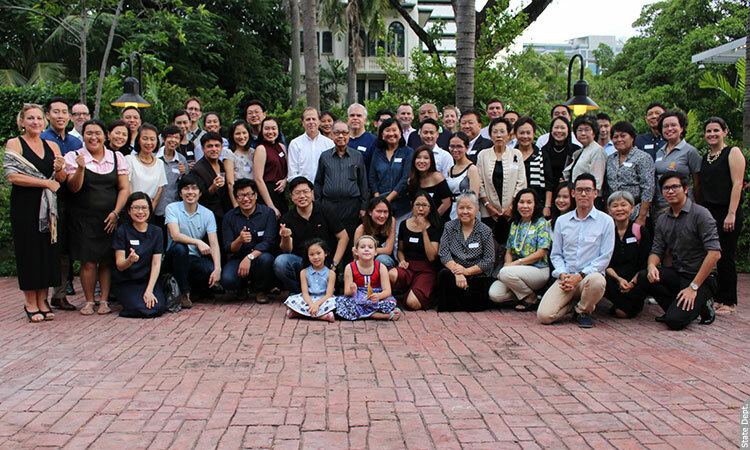 On September 23, U.S. Fulbright Scholar Abbie Kiesa led a workshop for more than 20 participants called “Democracy Classroom: Civic Participation” at Book: Republic. 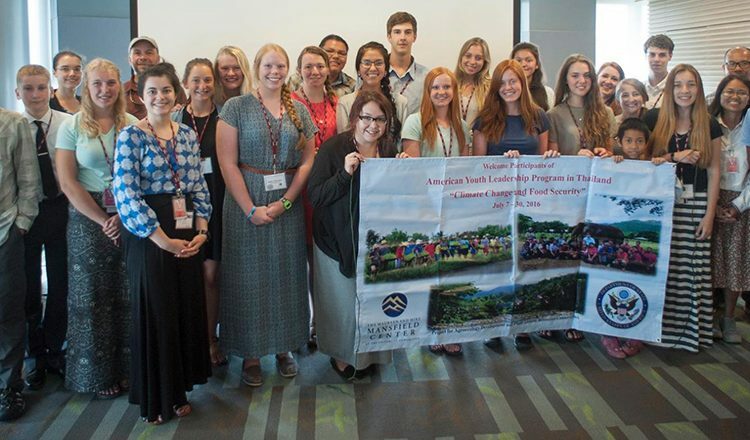 Abby specializes in youth civic engagement, political engagement, and the democratic work of higher education. 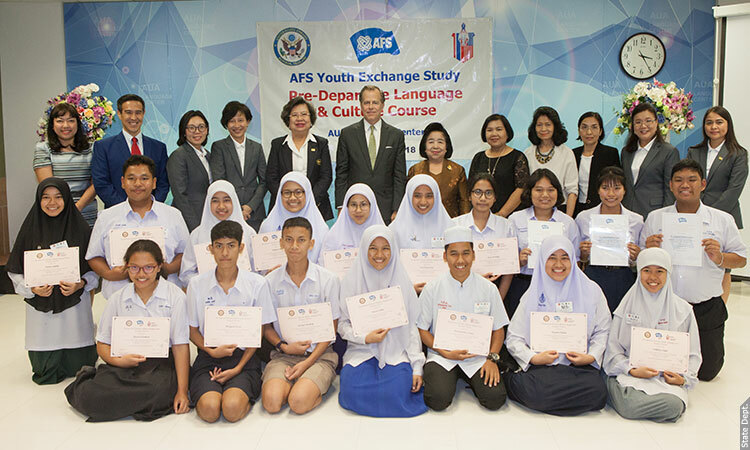 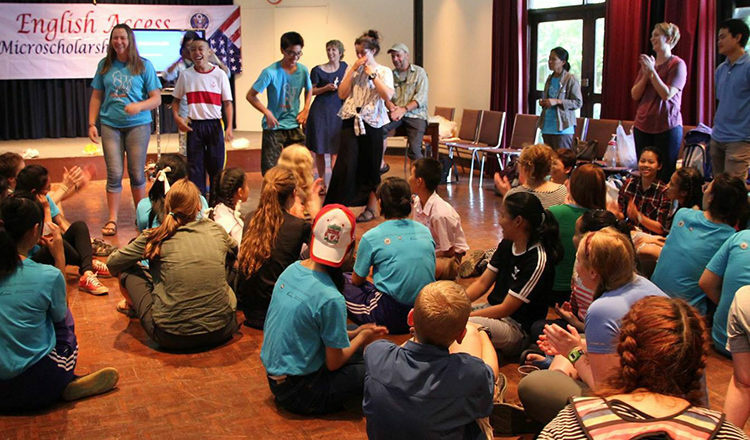 By U.S. Embassy Bangkok | 16 September, 2016 | Topics: Education, Events, Study in the U.S.
On July 26th, American Youth Leadership Program Thailand 2016, sponsored by the U.S. Department of State, engaged 20 Montana high school students and two adult participants at AUA Chiang Mai on an all-expense paid study of Thailand focused on food security, climate change, leadership development, and community service. 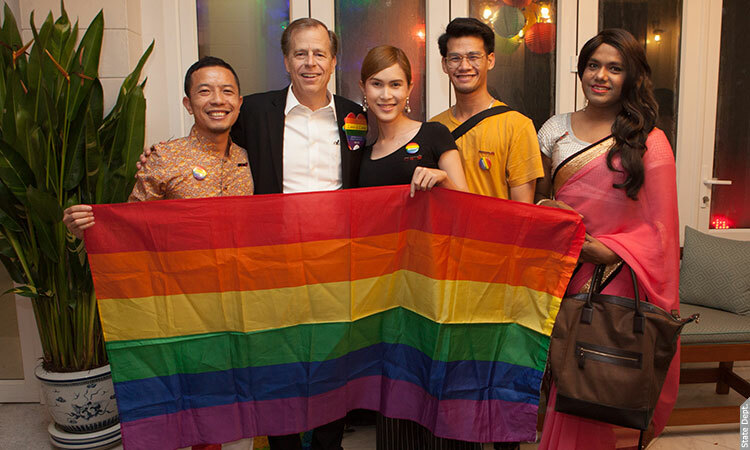 On June 16, Ambassador Glyn T. Davies hosted an Iftar dinner to honor the Thai Muslim community and friends of all faiths. 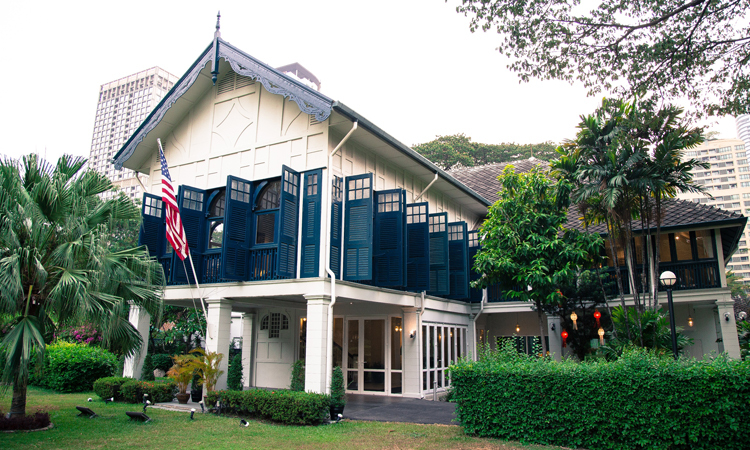 Iftars are an important part of religious observances during the holy month of Ramadan. 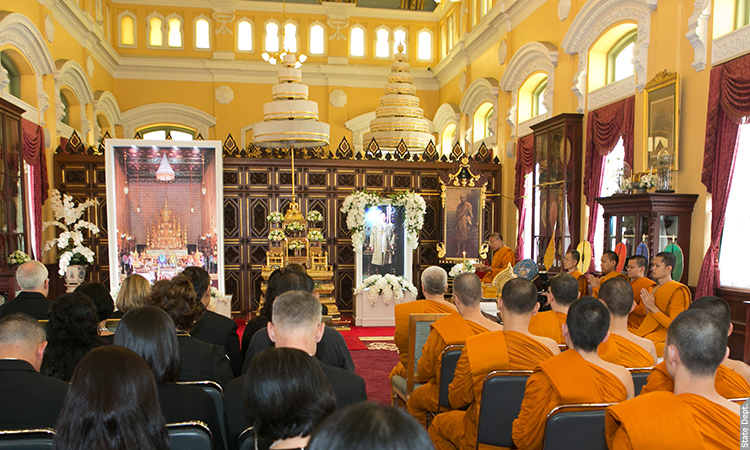 The guests included religious leaders, academics, civil society members, students, and foreign diplomats. 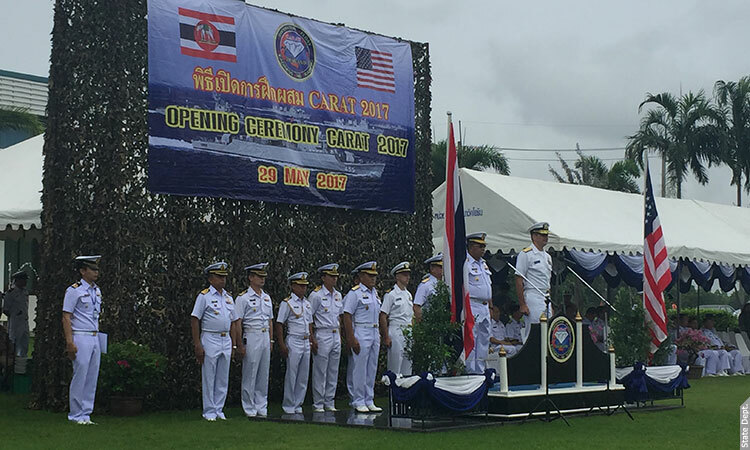 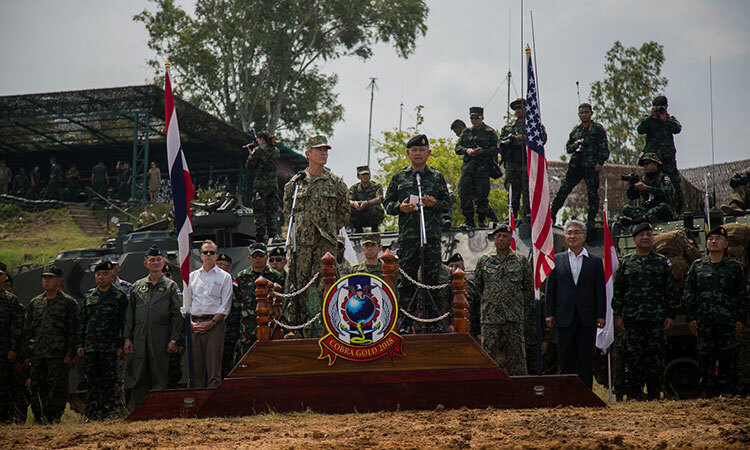 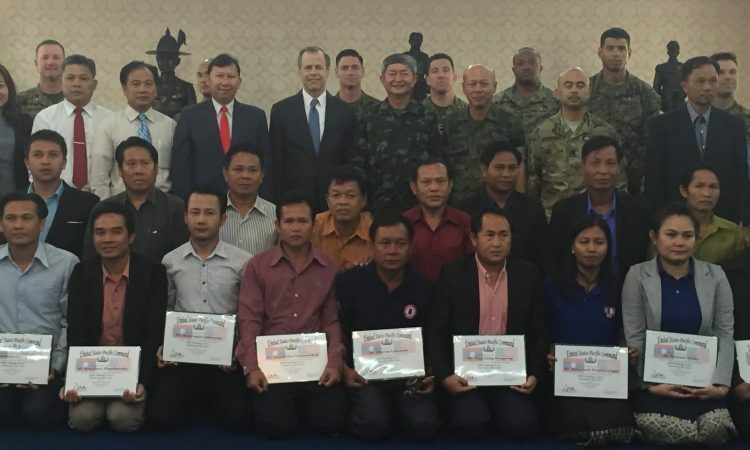 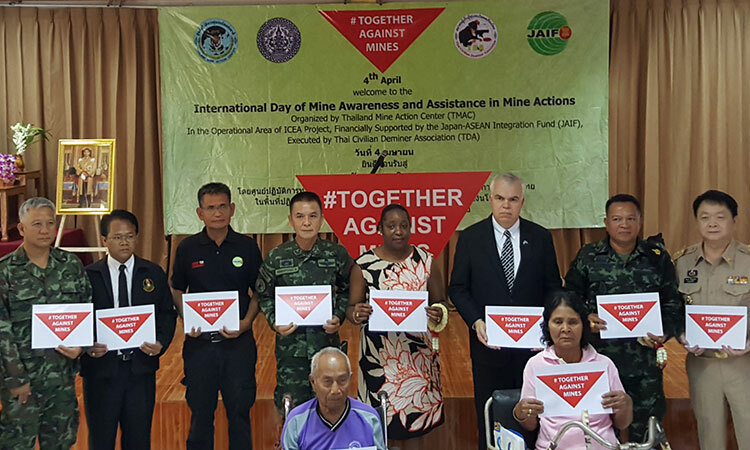 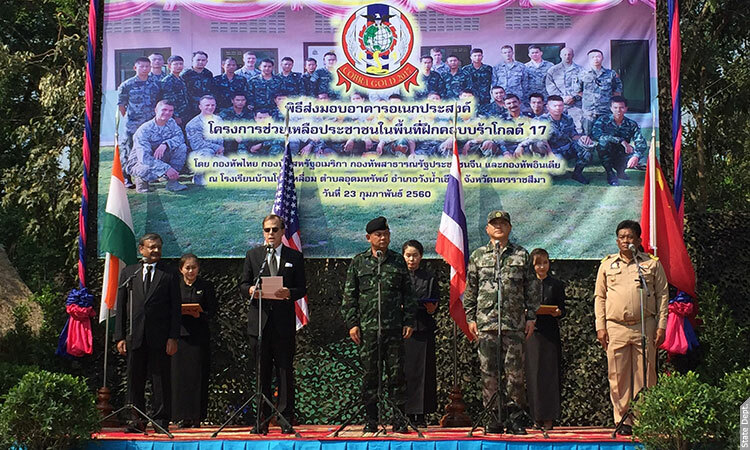 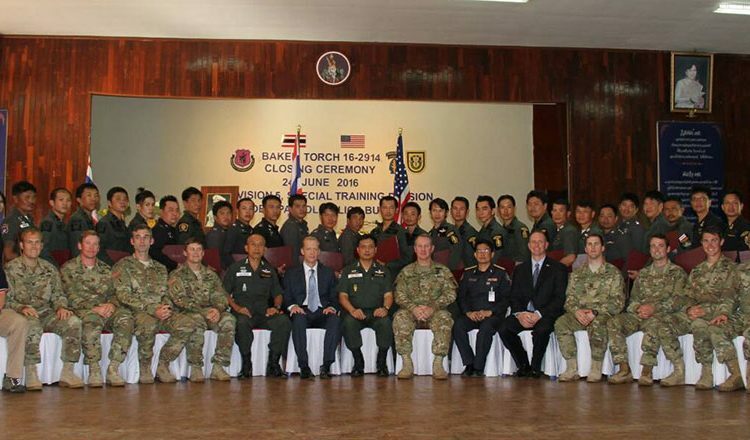 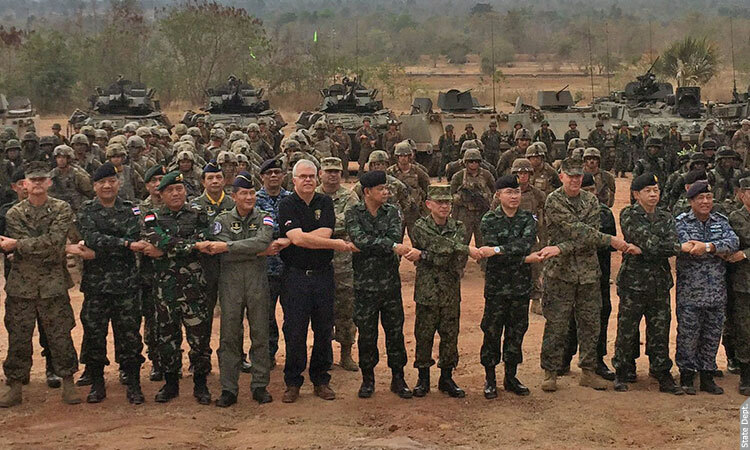 The Graduation Ceremony for the Trilateral (U.S.-Thailand-Laos) Humanitarian Mine Action Training.